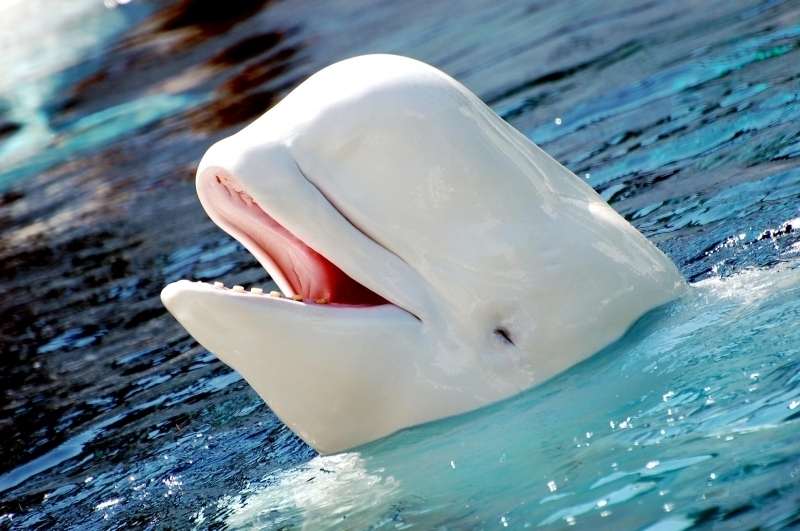 The Beluga Whale is a small, toothed whale that is white as an adult. 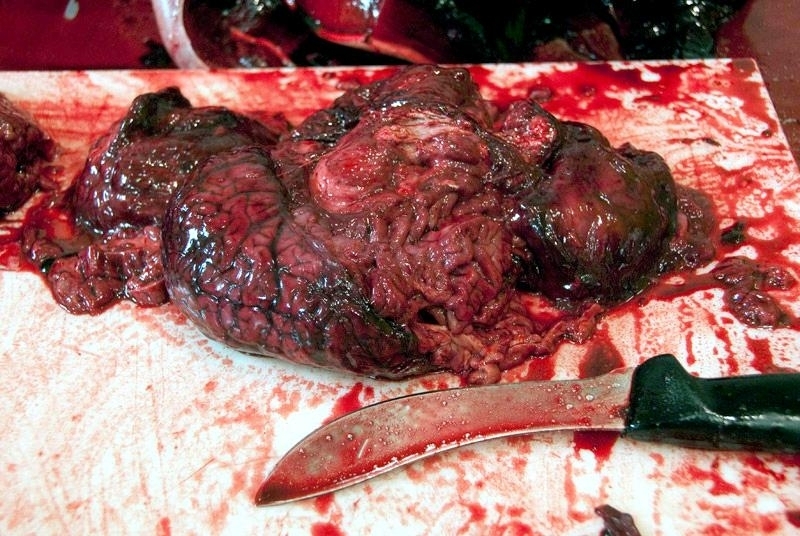 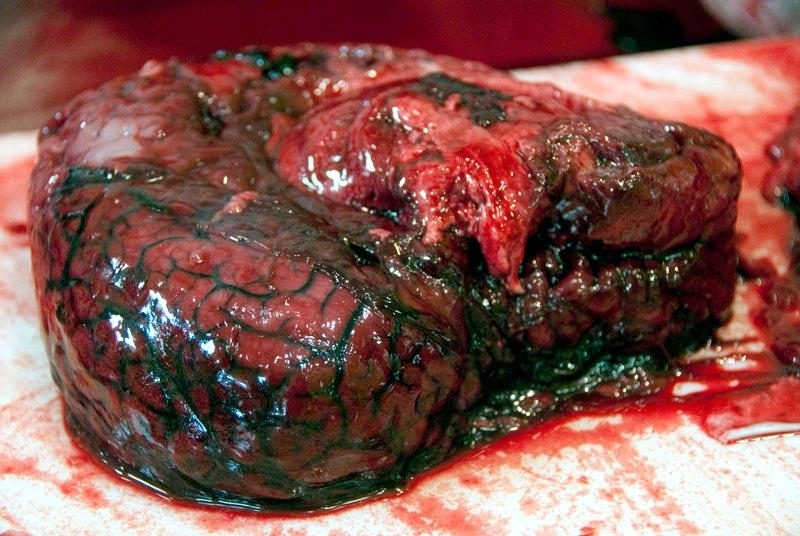 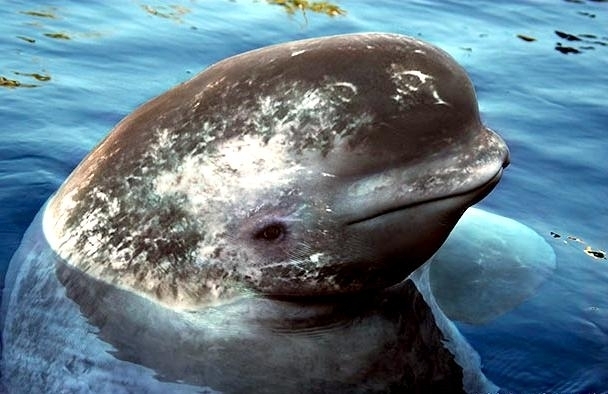 The body is stout and has a small, blunt head with a small beak, tiny eyes, thick layers of blubber and a rounded melon. 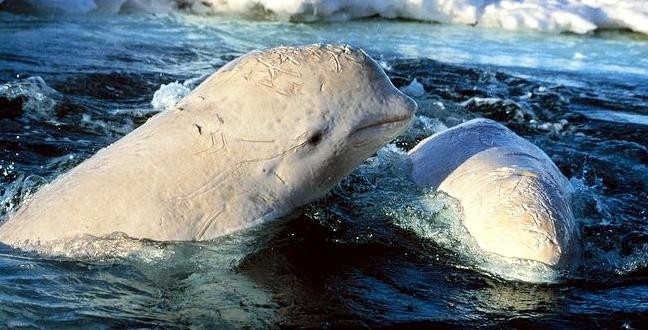 Beluga means “white one” in Russian. 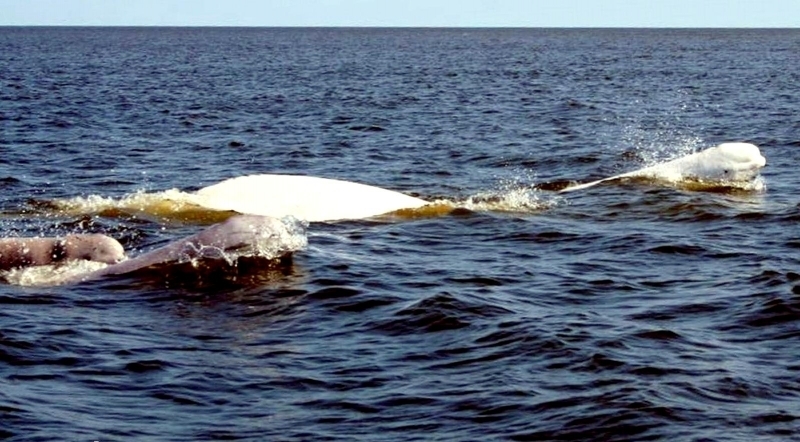 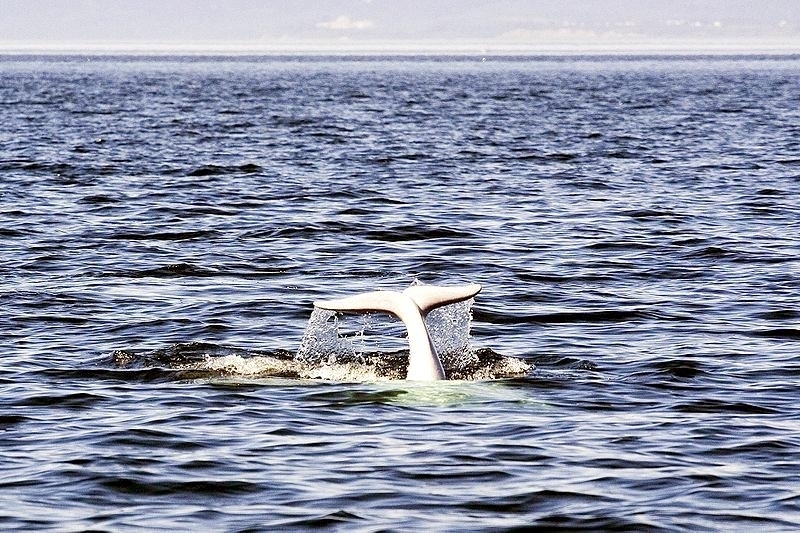 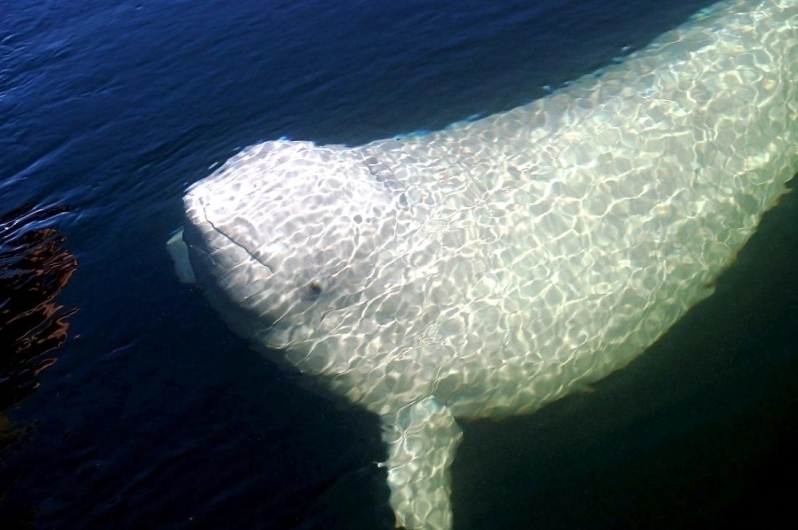 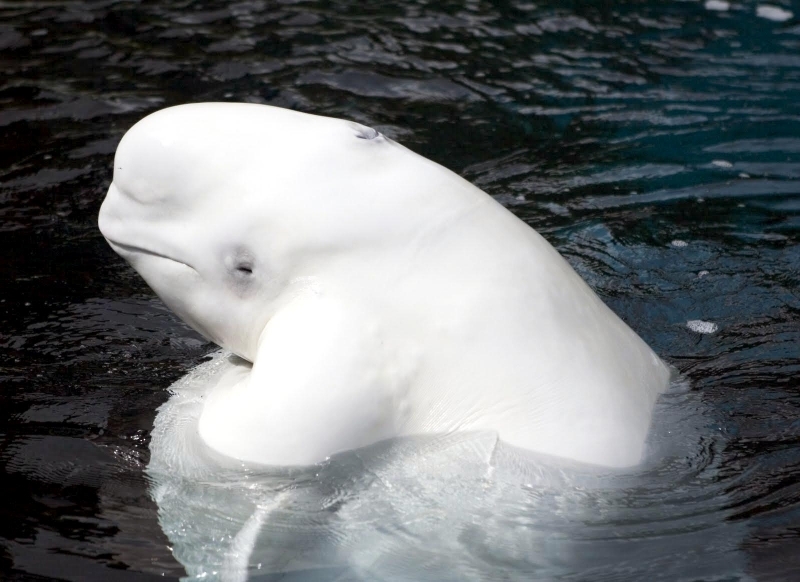 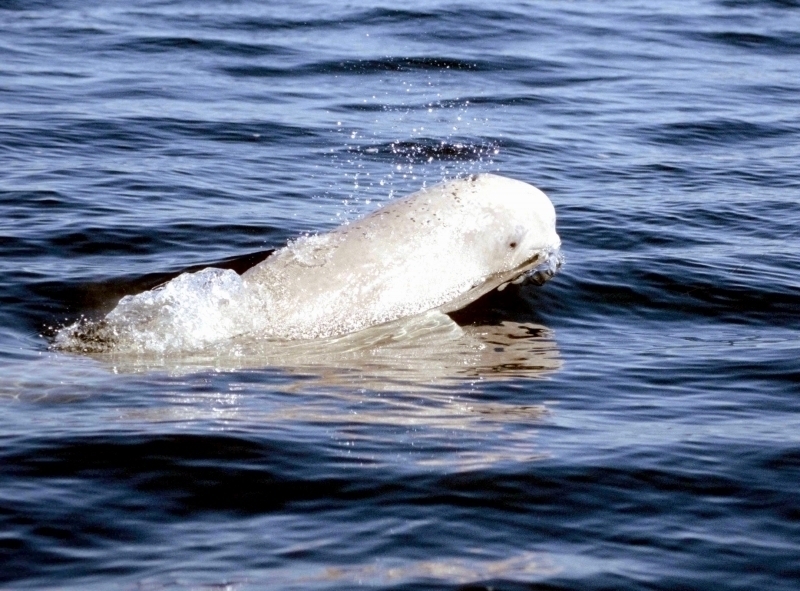 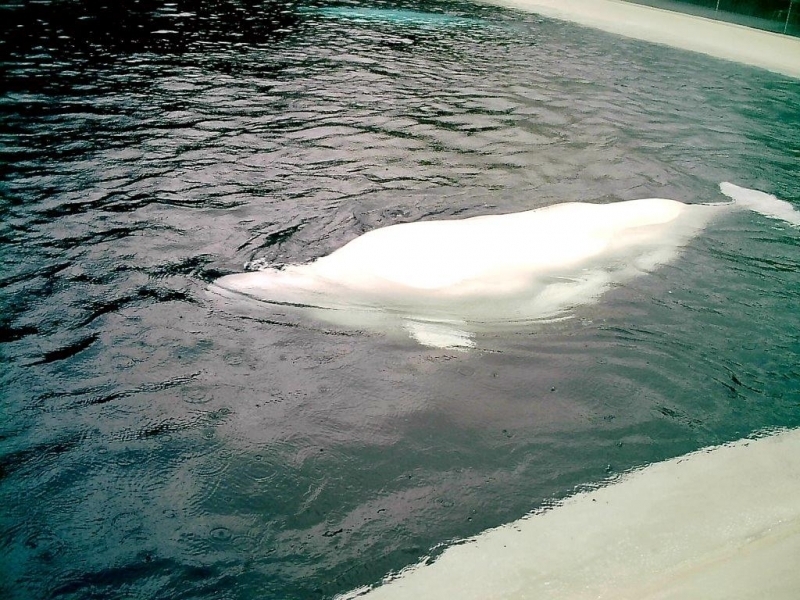 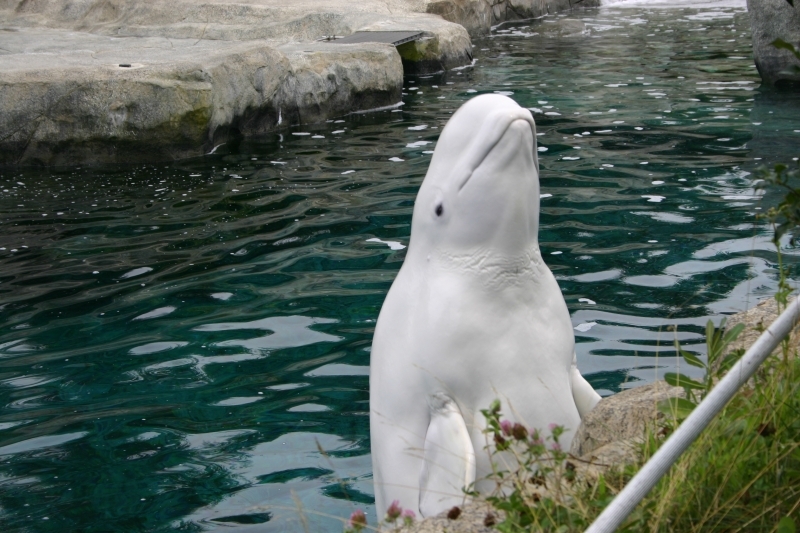 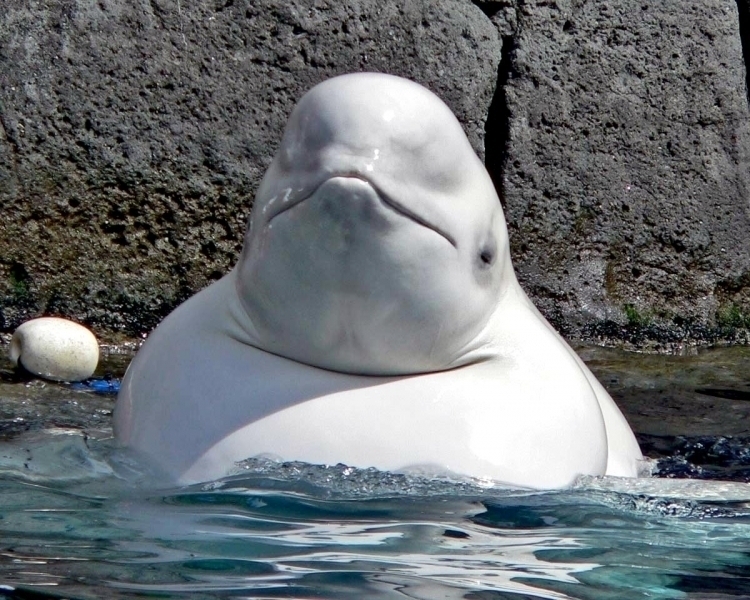 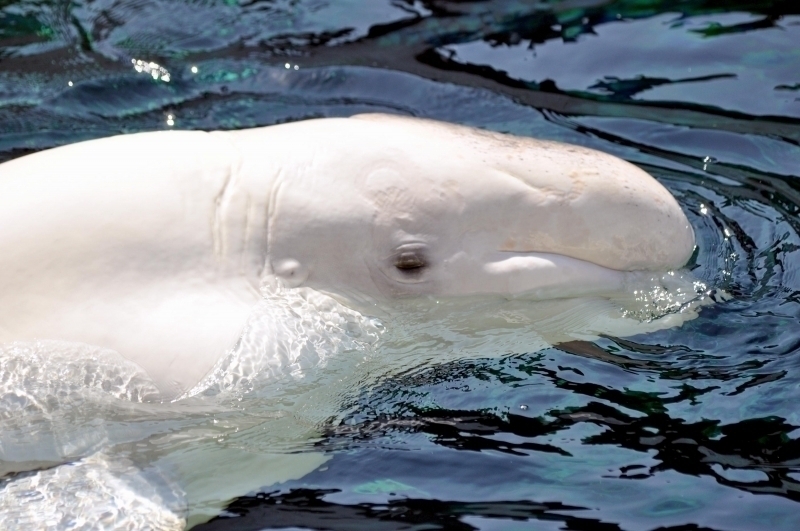 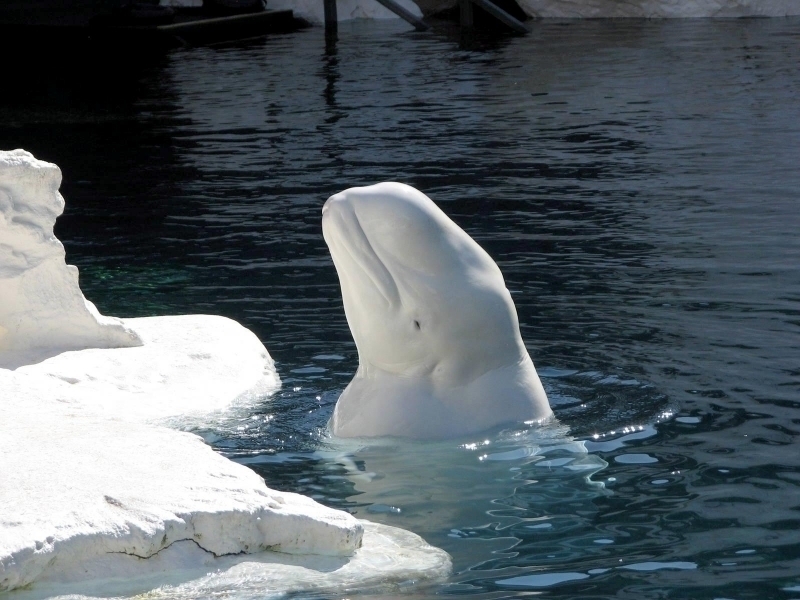 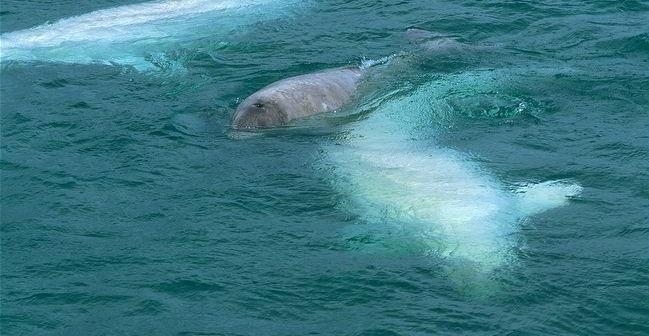 Its genus, Delphinapterus means “whale without fins” and the species, leucas means “white”. 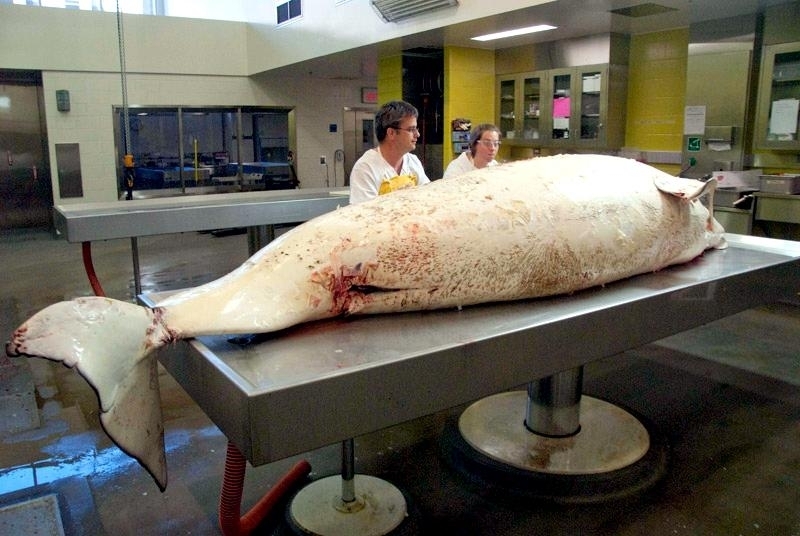 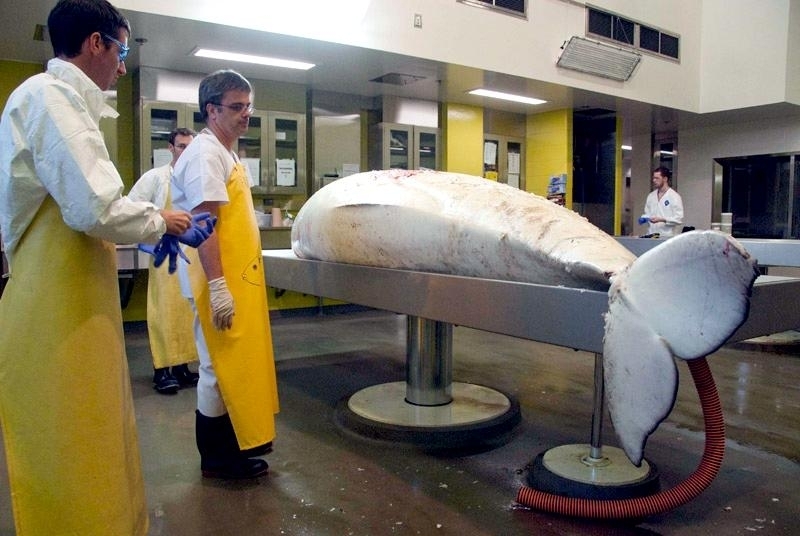 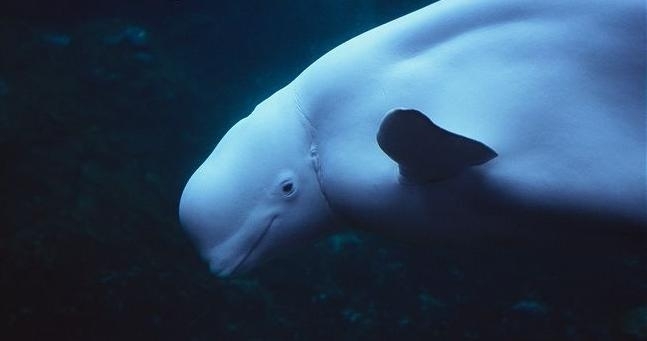 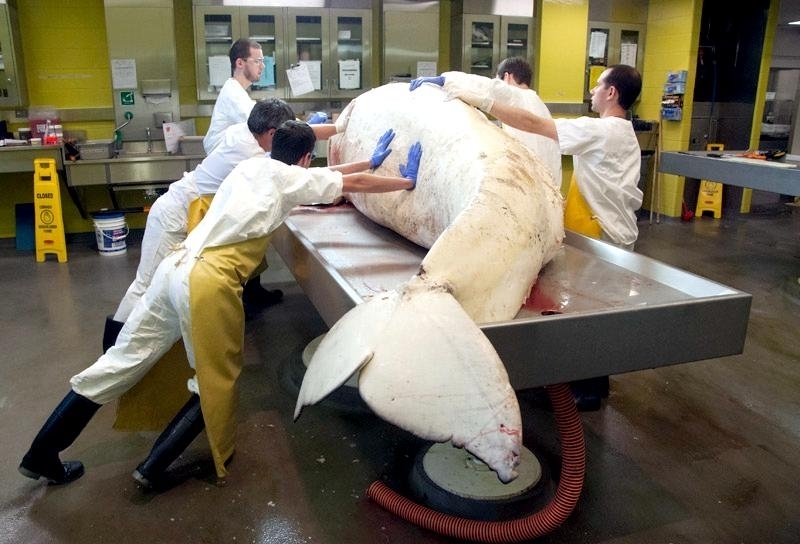 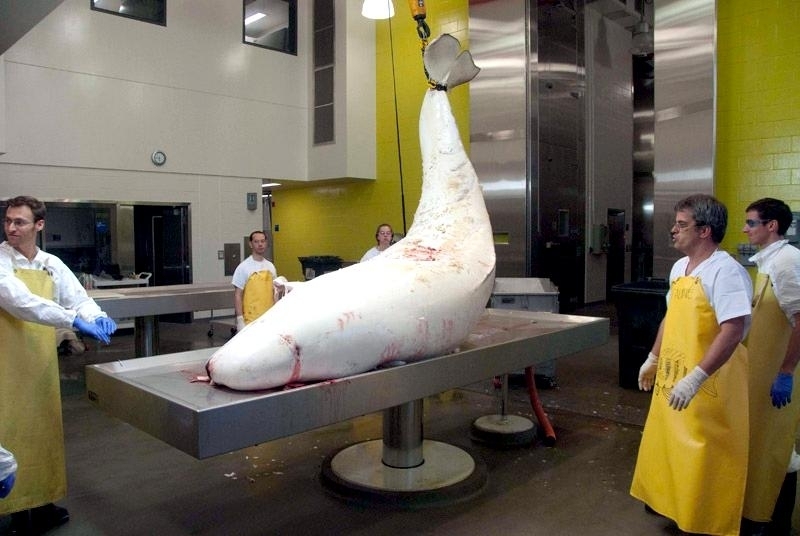 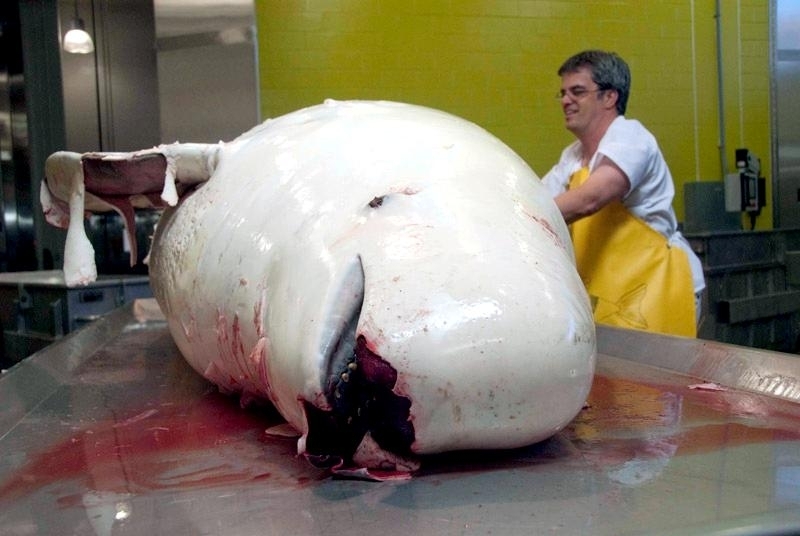 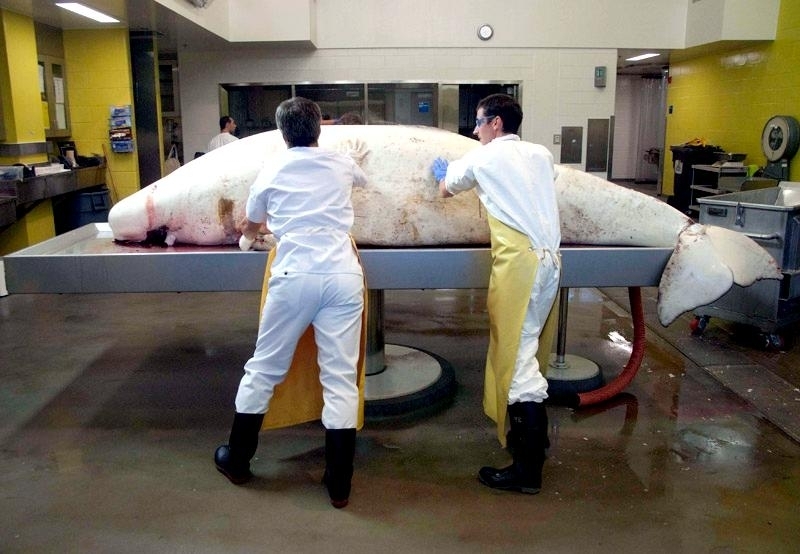 The Beluga Whale is also called the White Whale, the White Porpoise and the Squid Hound due to its diet. 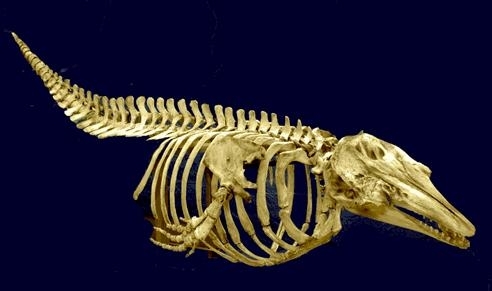 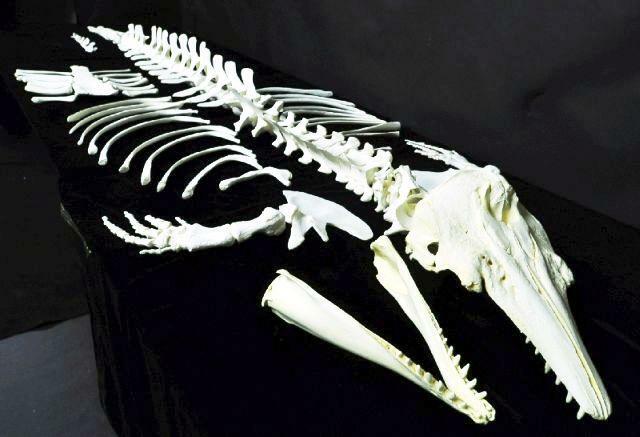 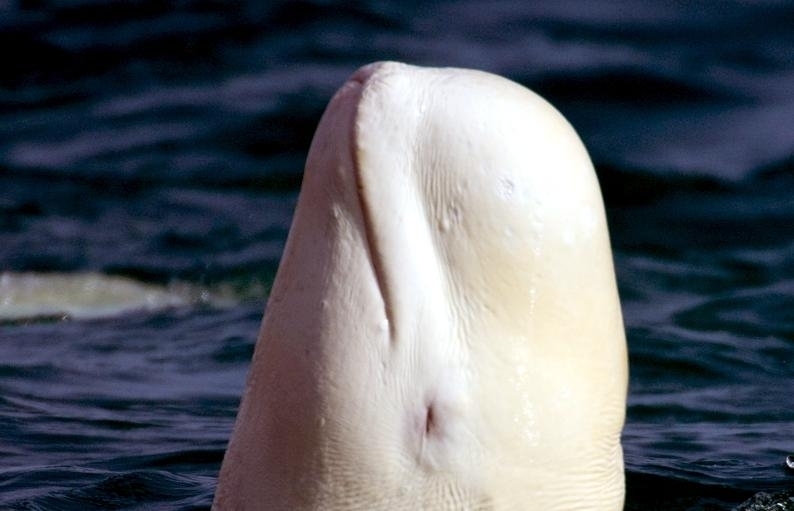 Unlike most other cetaceans, the Beluga’s 7 neck vertebrae are not fused giving it a flexible, well-defined neck. 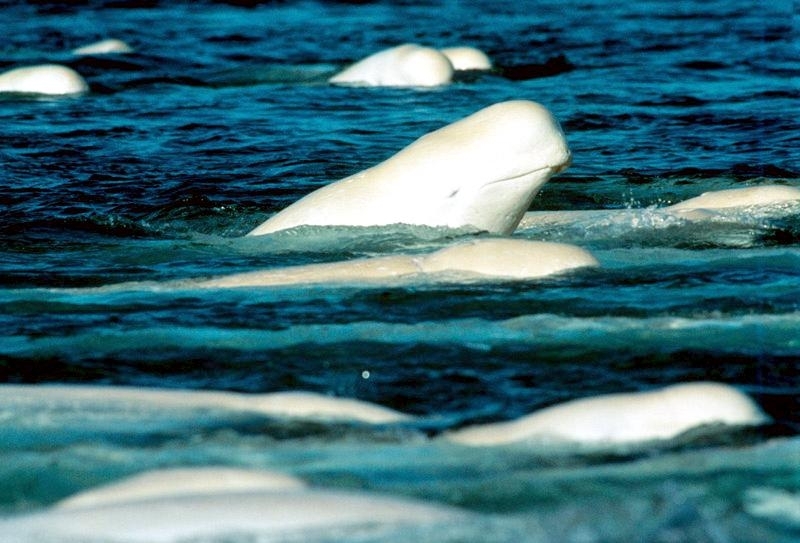 Beluga Whales are very social animals and congregate in pods of 2-25 whales, with an average pod size of 10 whales consisting of both males & females or mothers and calves. 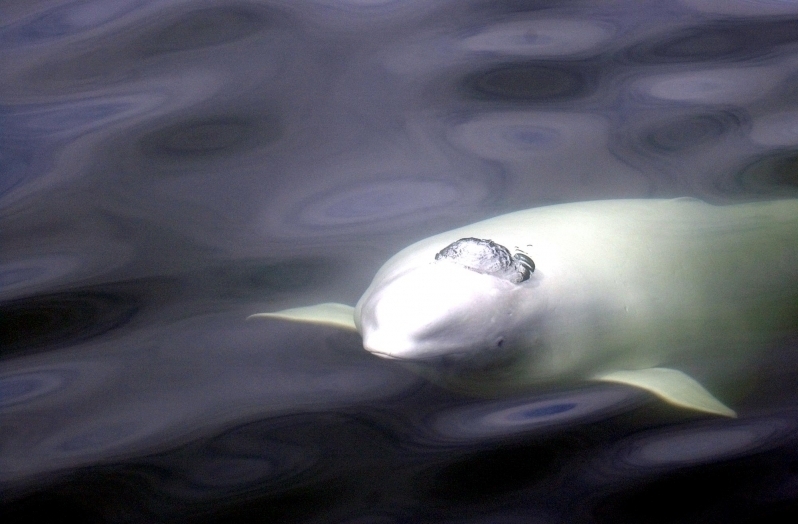 A pod will hunt & migrate as a group. 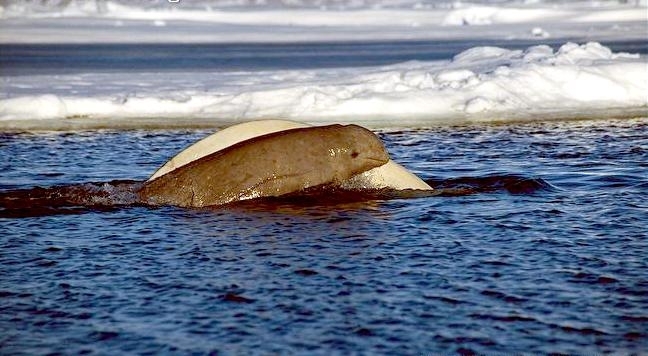 The bond between mothers & calves is the strongest. 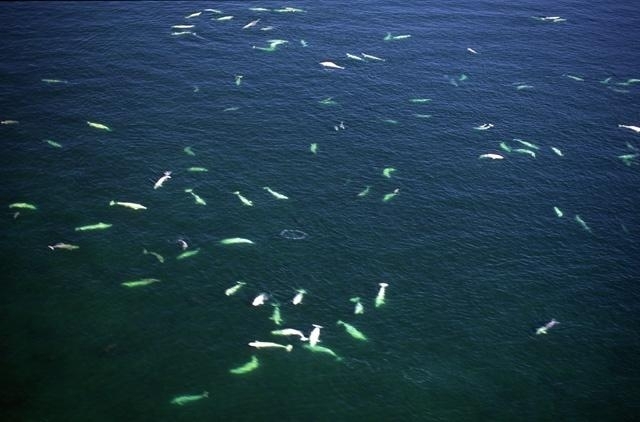 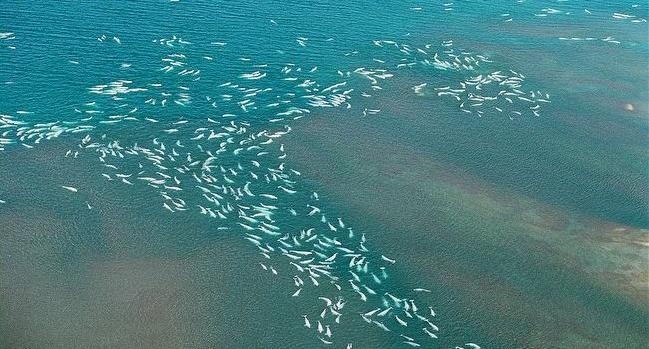 During migrations, several pods may join together forming super pods of 200-1,000 animals. 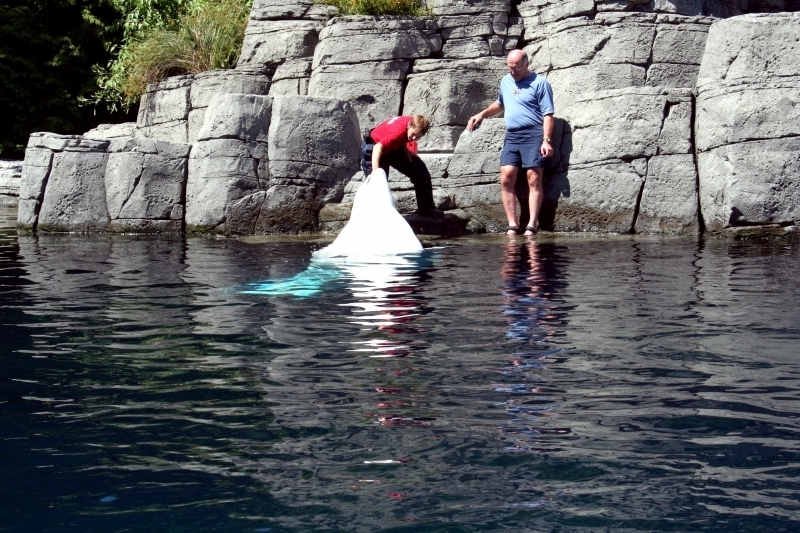 Belugas usually dive for about 3-15 minutes while hunting for food. 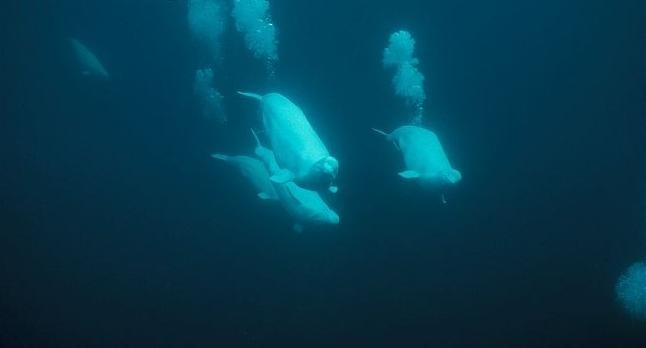 They can travel for about 1.5 miles during a dive and commonly dive to a depth of 66 feet to hunt. They can dive to a depth of about 1,300-2,100 feet at times. 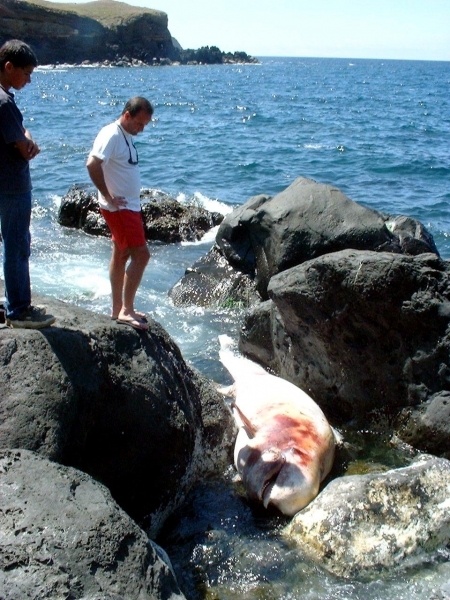 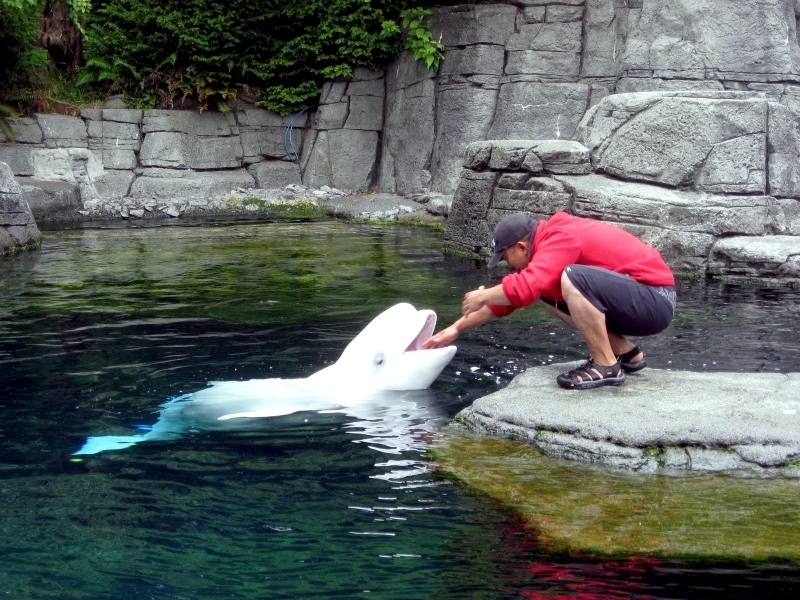 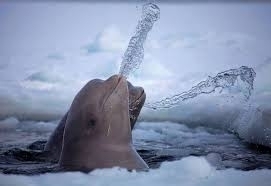 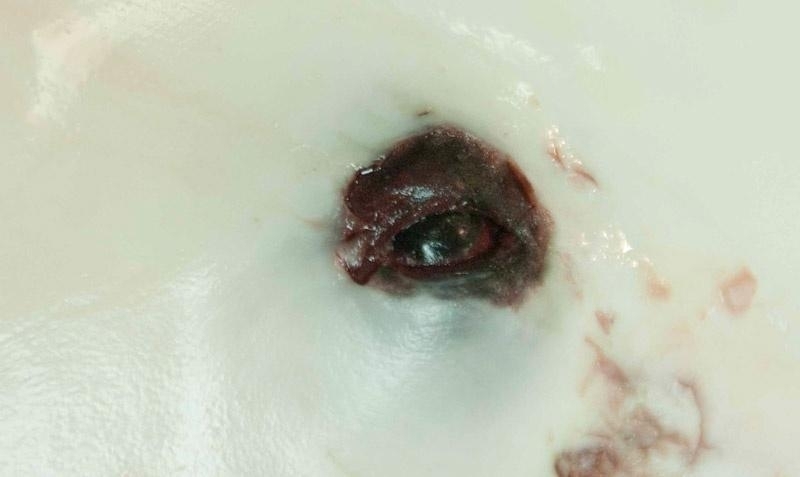 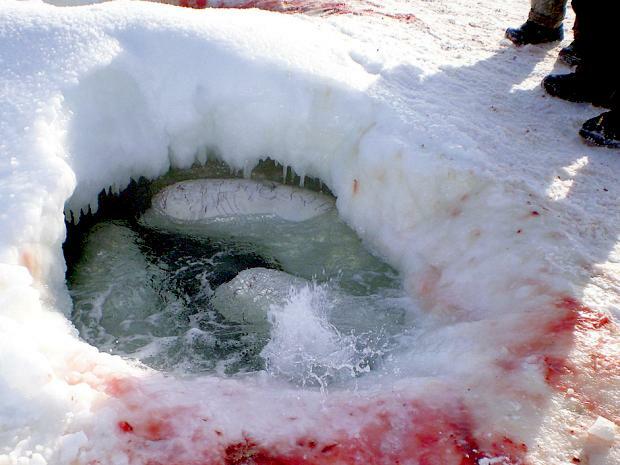 To open its single blowhole, a Beluga contracts the muscular flap that covers it and is relaxed in a closed position. 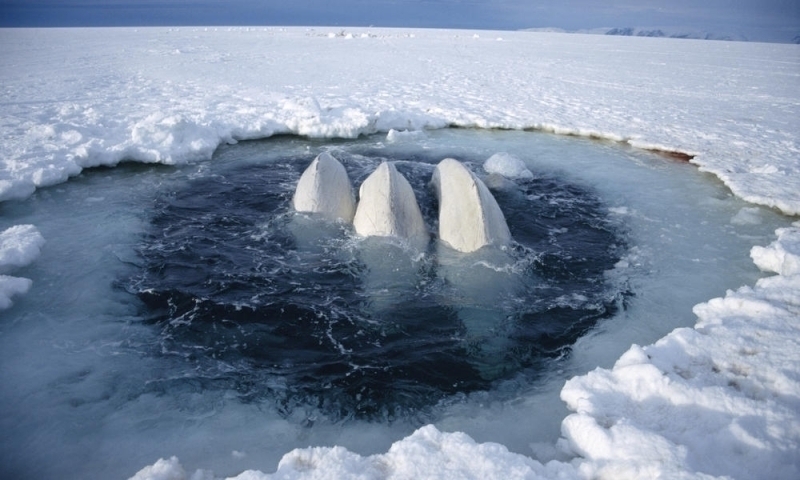 Their spout is about 3 feet in height. 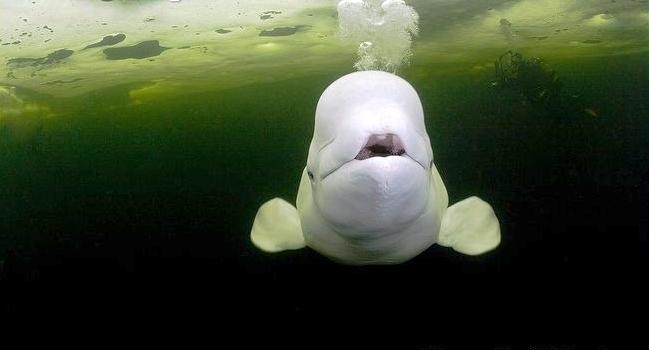 Beluga Whales are relatively slow swimmers. 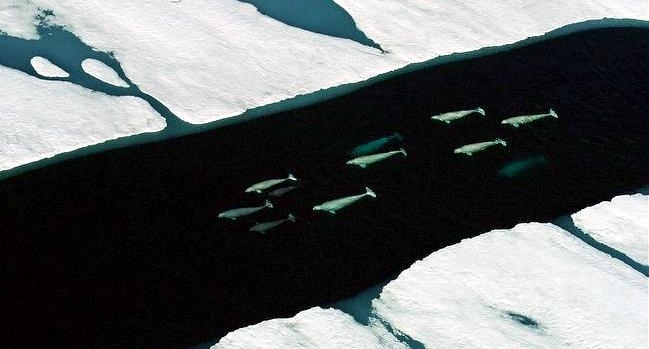 They swim about 2-6 mph. 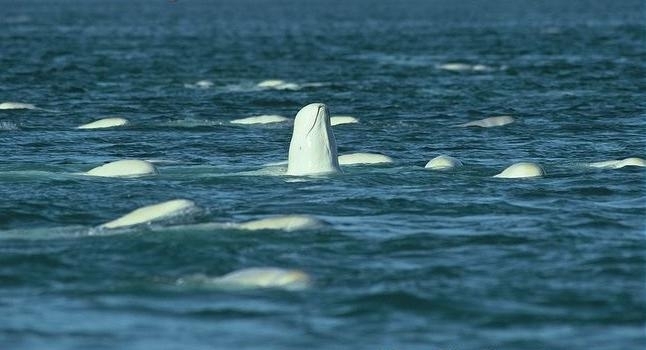 They are capable of short bursts of speed up to 14 mph for about 15 minutes. 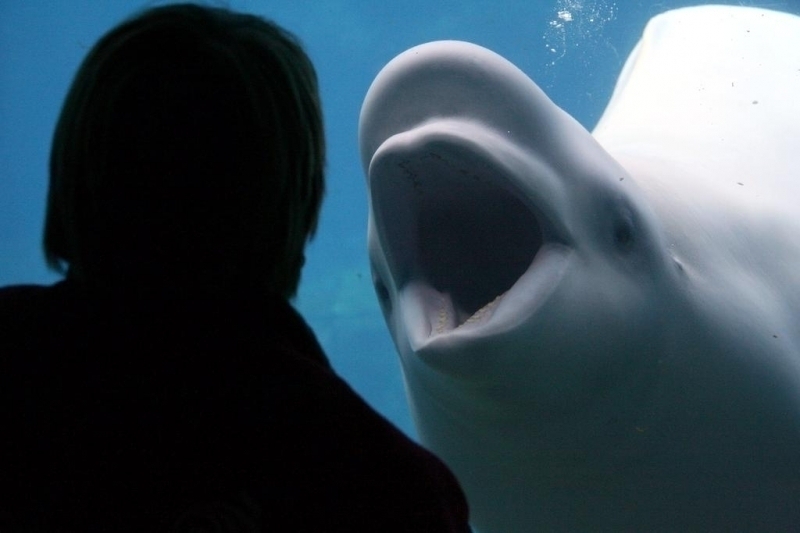 Beluga Whales grow to be about 15 feet long on average, weighing up to about 3,300 pounds. 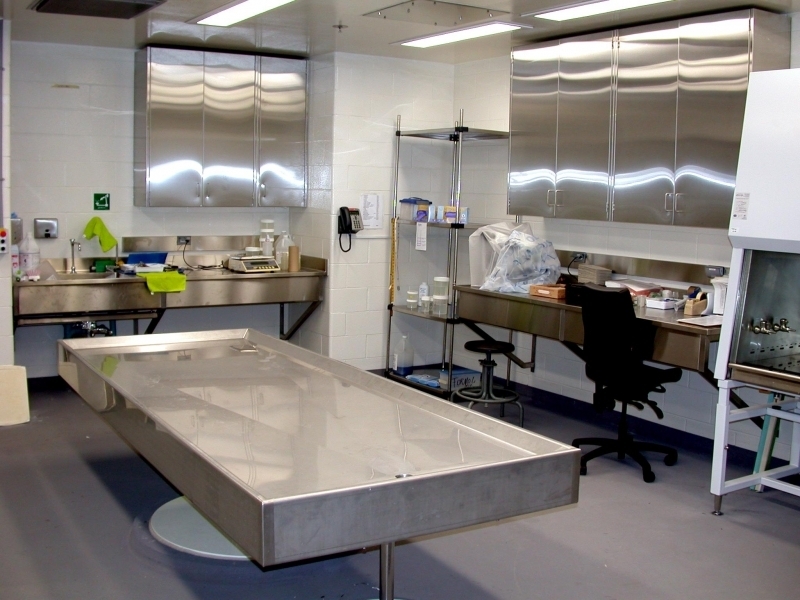 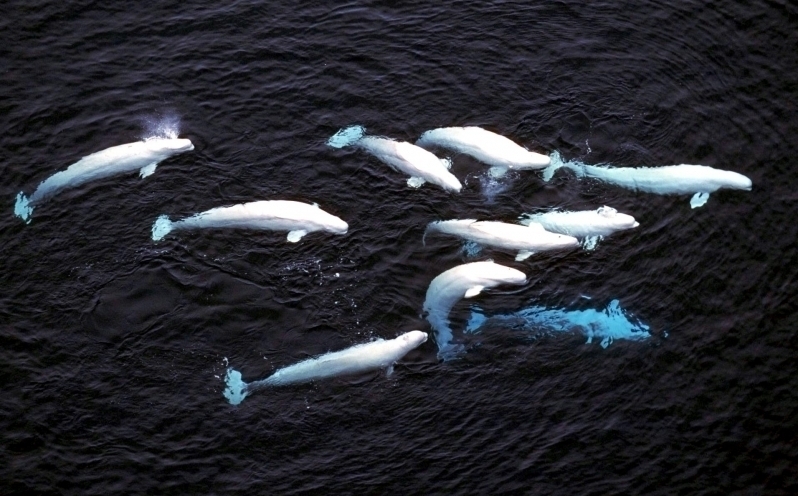 Males are slightly larger than females. 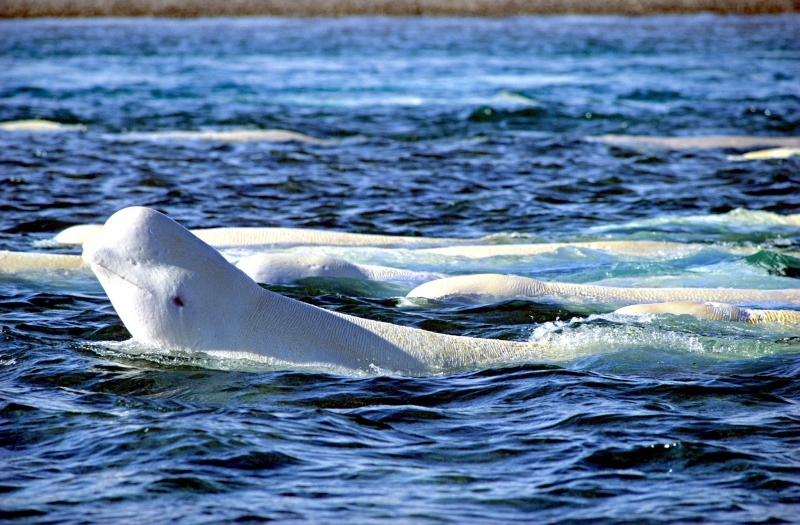 The Beluga is white as an adult and molts seasonally. 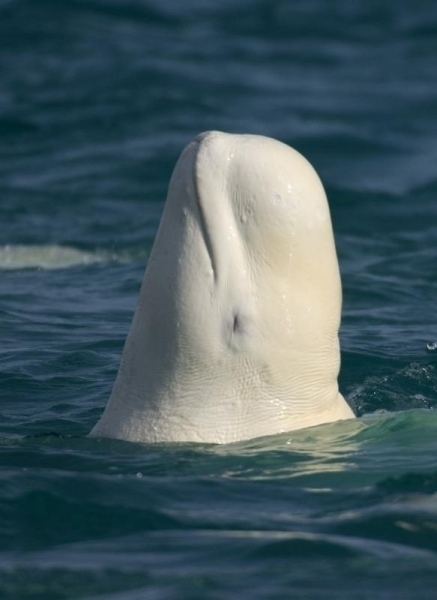 The Beluga’s body is stout and has a small, blunt head with a beak, a well-defined neck and a rounded melon. 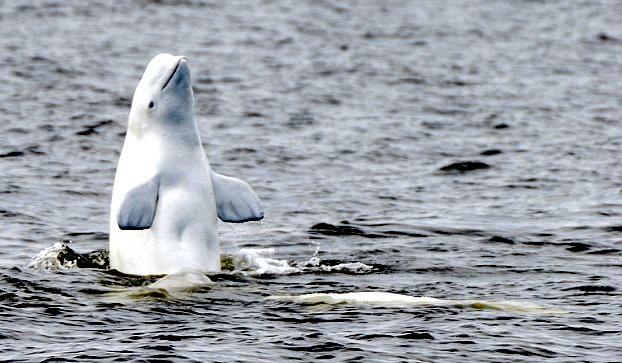 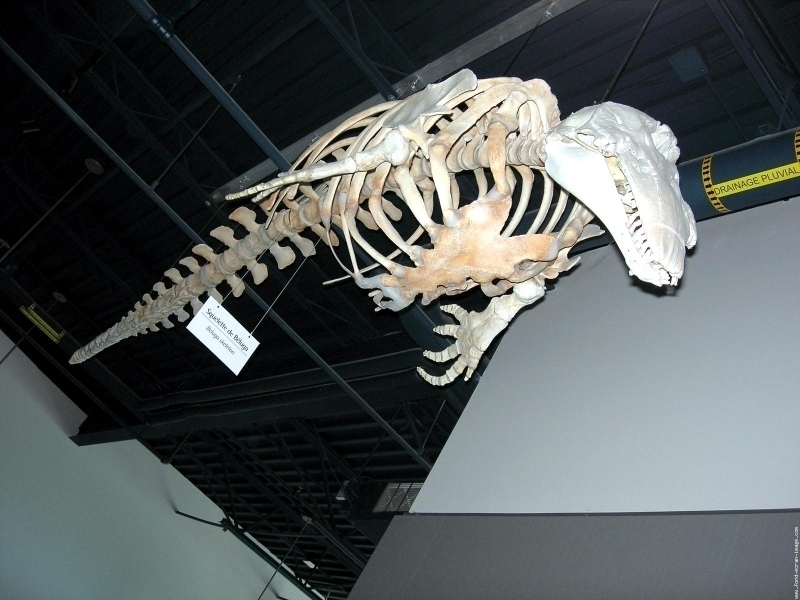 It has no dorsal fin, which makes swimming under Arctic ice sheets easier. 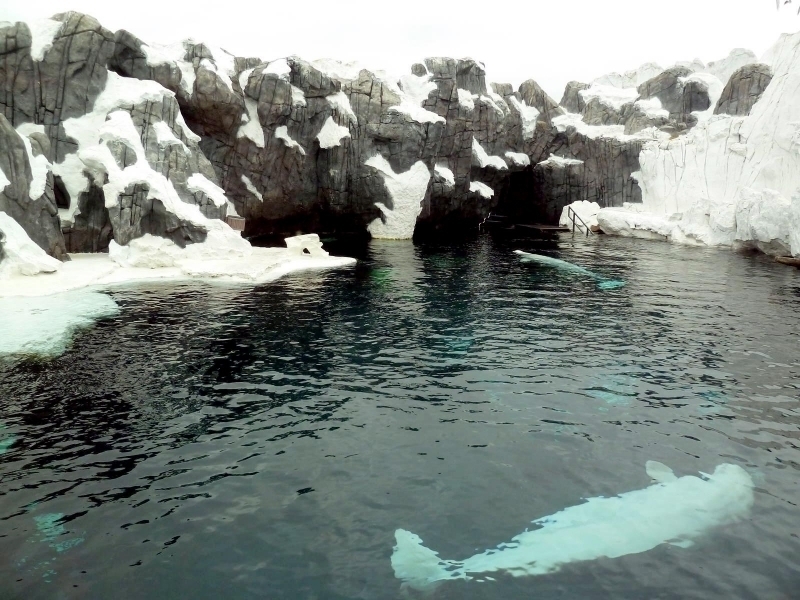 The flippers are short, rounded & wide. 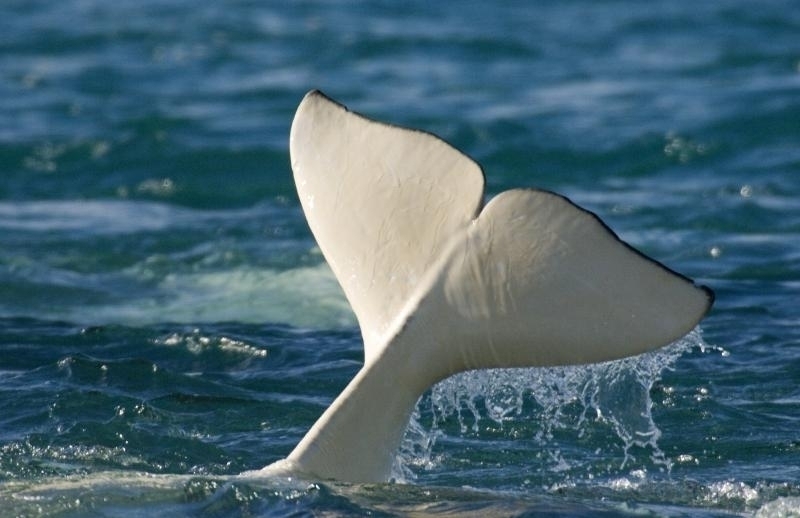 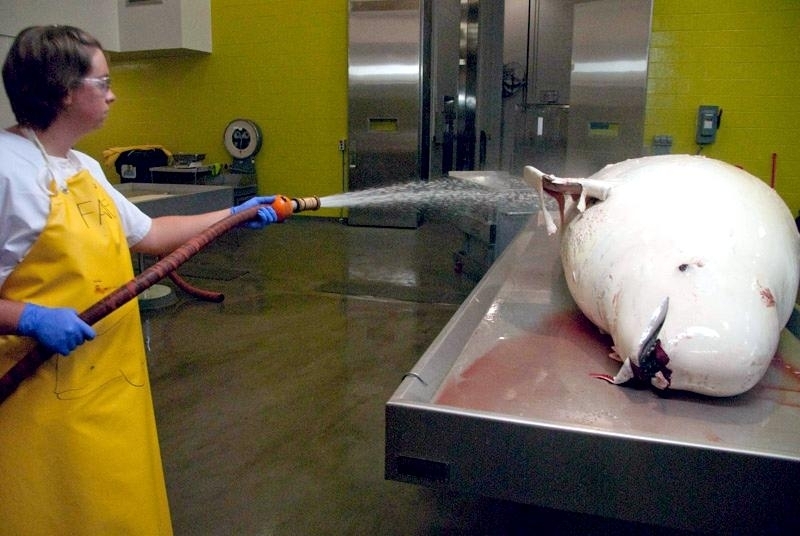 The tail flukes are wide & deeply notched. 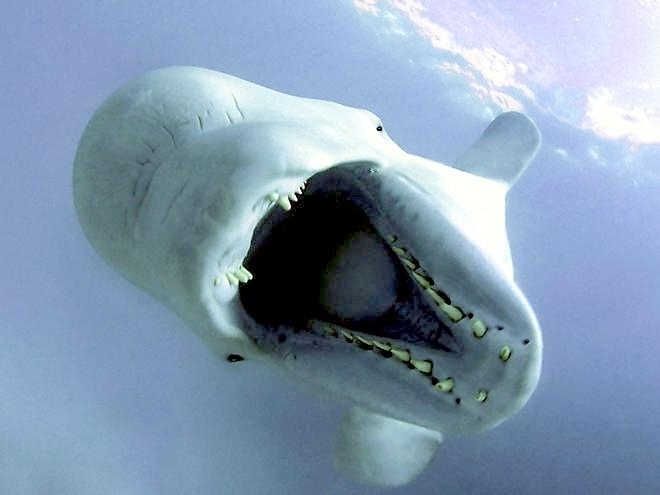 Beluga Whales are toothed whales with 34 teeth. 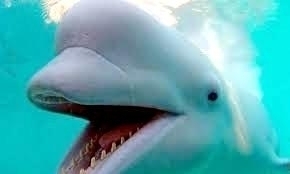 The teeth are not designed for chewing, but for grabbing & tearing prey. 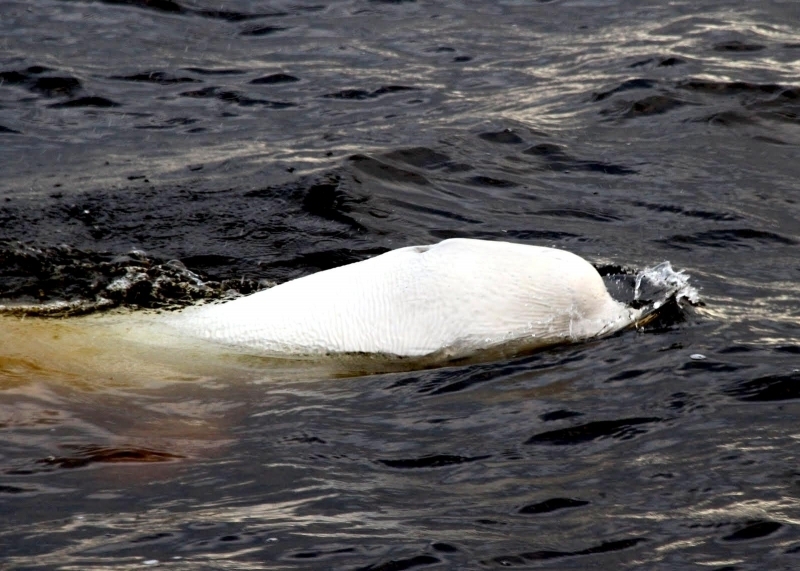 They swallow their prey whole and they are opportunistic feeders, eating a varied diet of fish, squid, crustaceans, octopus and worms. 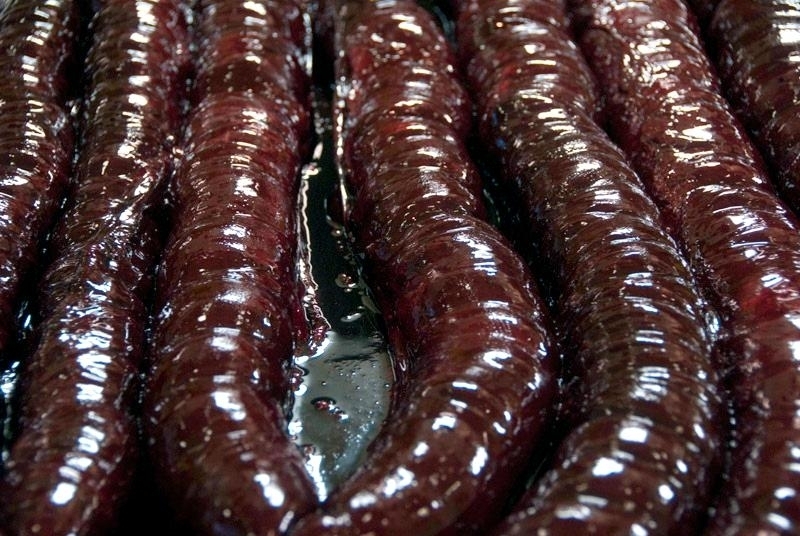 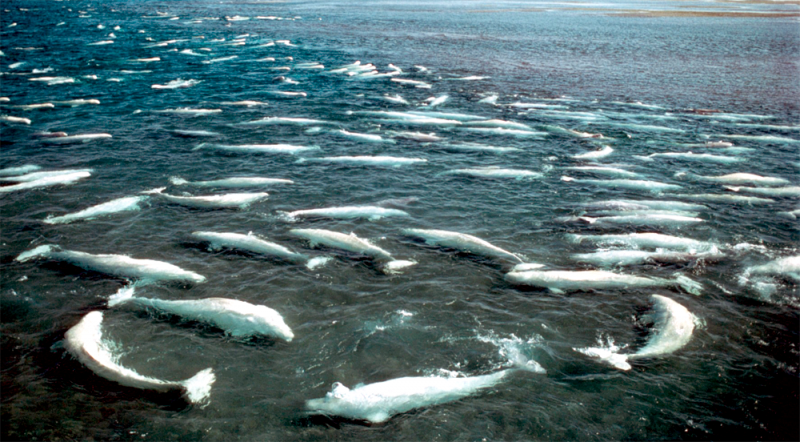 They are both benthic or bottom and pelagic oceanic feeders in shallow water. 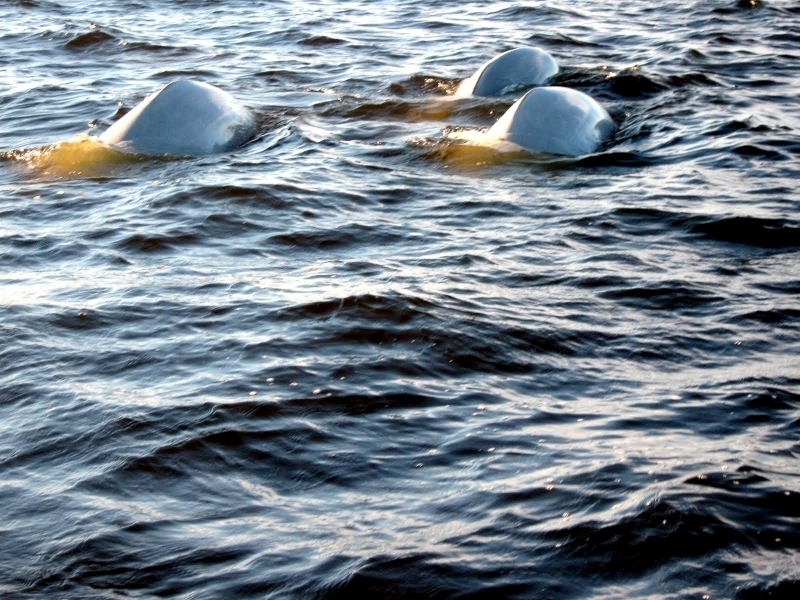 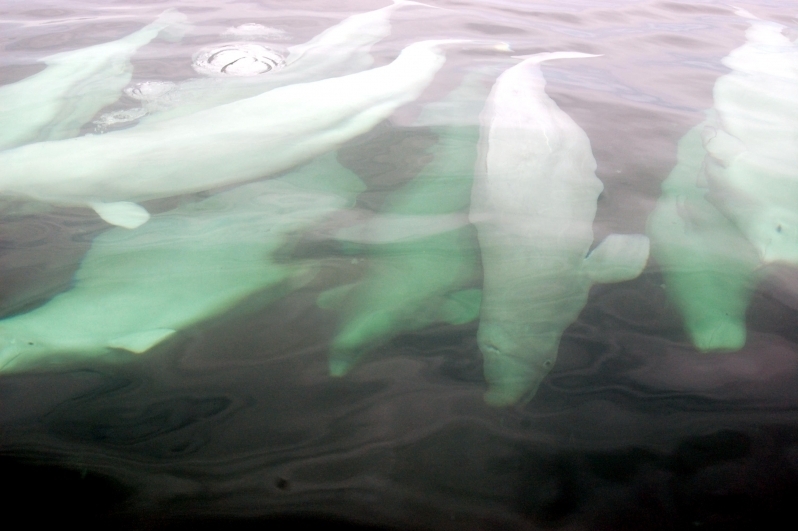 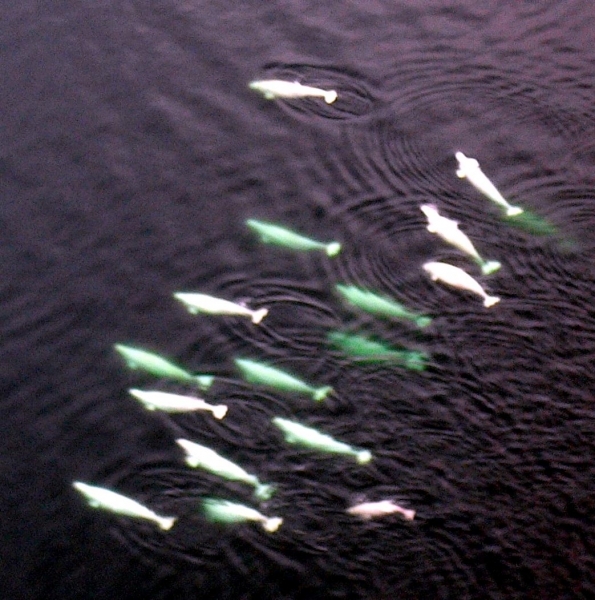 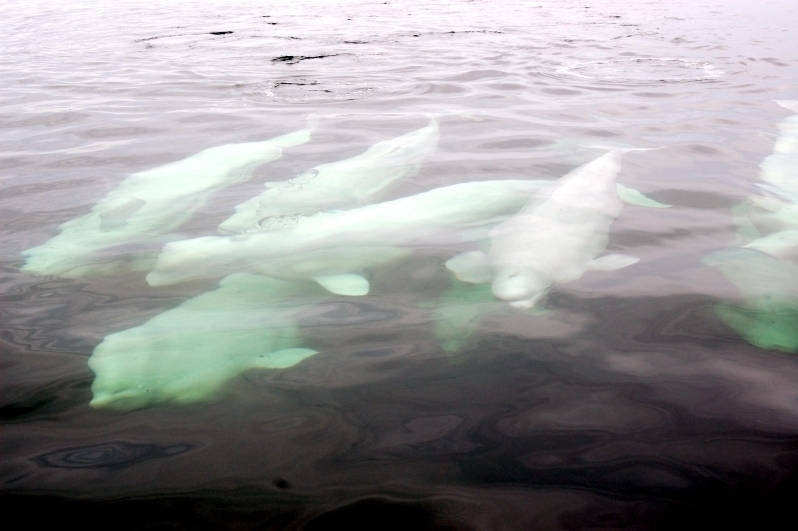 Belugas sometimes hunt schools of fish cooperatively in small pods. 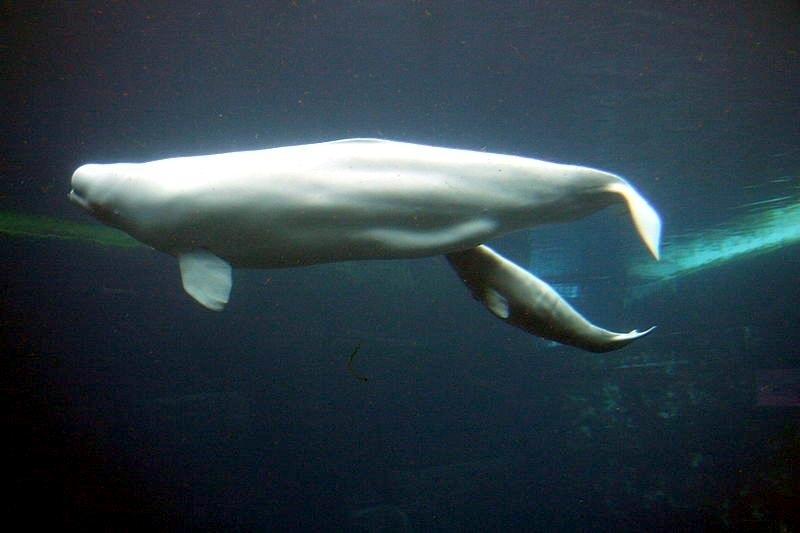 An adult Beluga will eat about 2.5% to 3% of its body weight per day or 50 pounds of food a day or more. 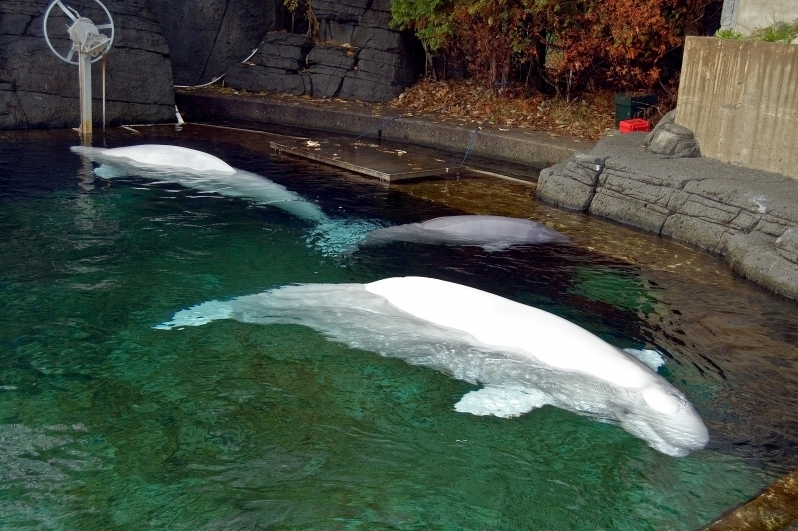 Belugas are also known as “Sea Canaries” because of their songs & chatter, which can even be heard above the water. 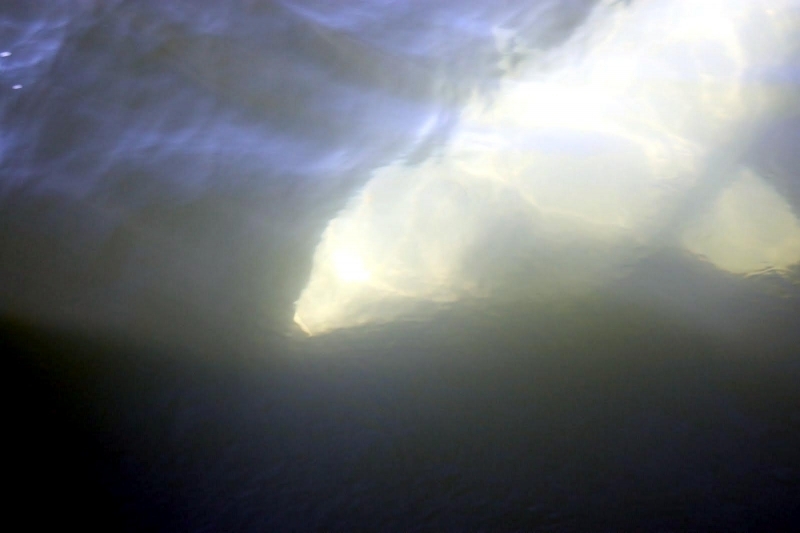 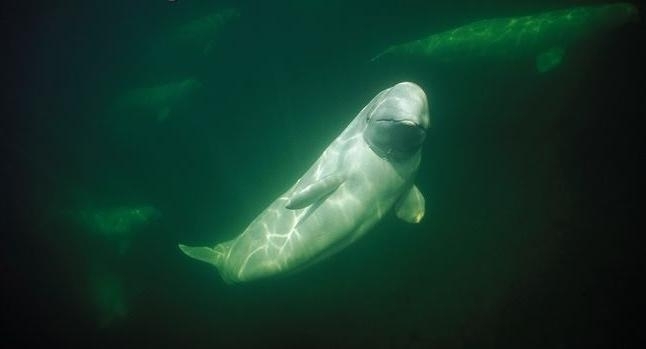 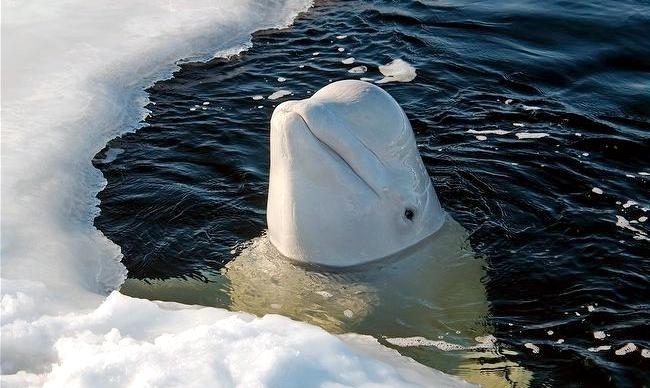 Belugas use echolocation to locate their bottom-dwelling prey, to find breathing holes in the Arctic ice sheet and to navigate in deep, dark waters. 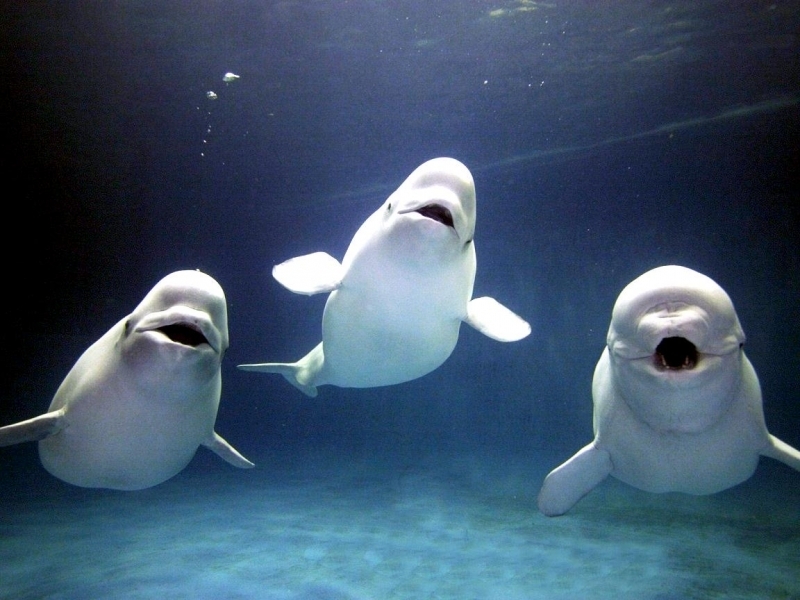 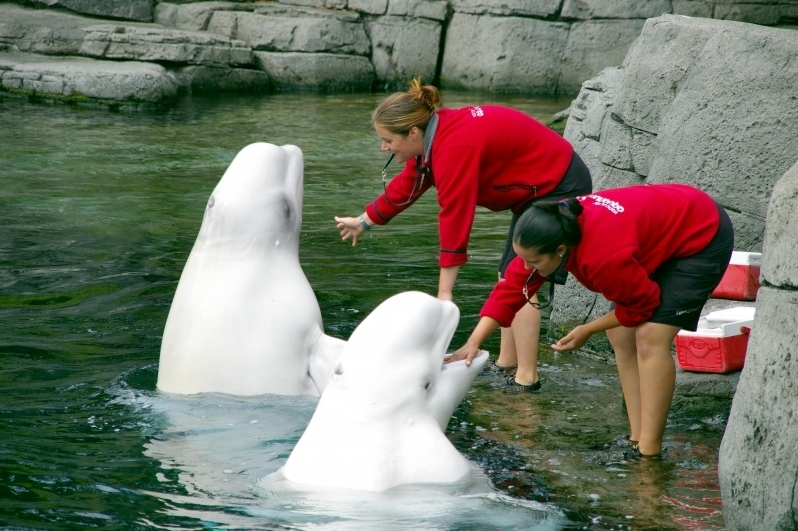 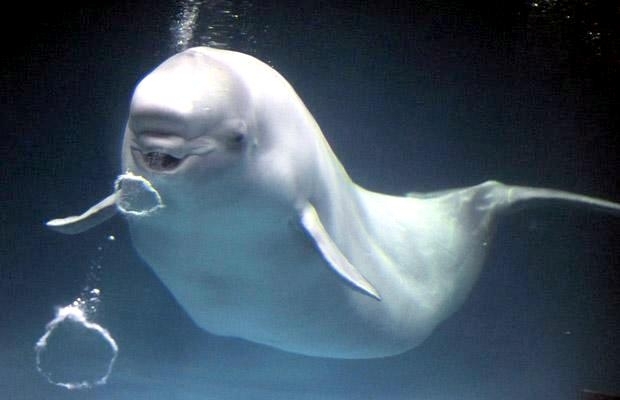 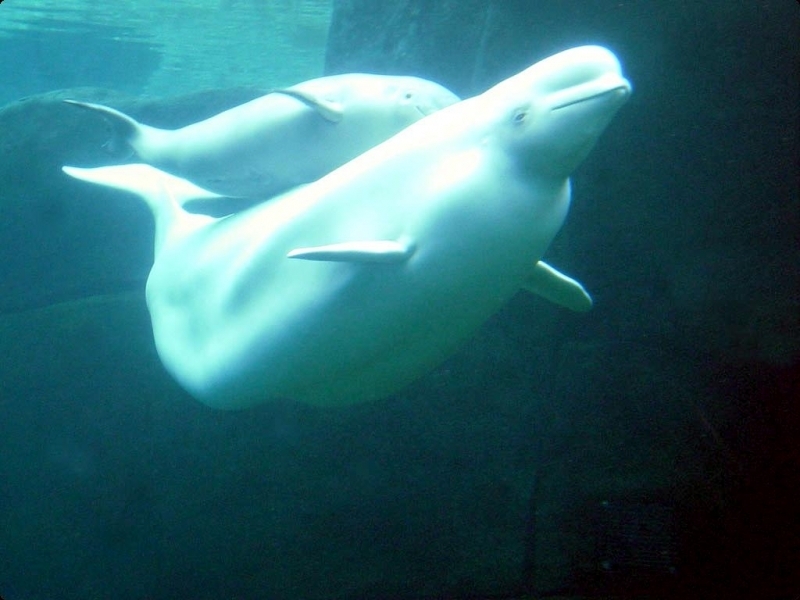 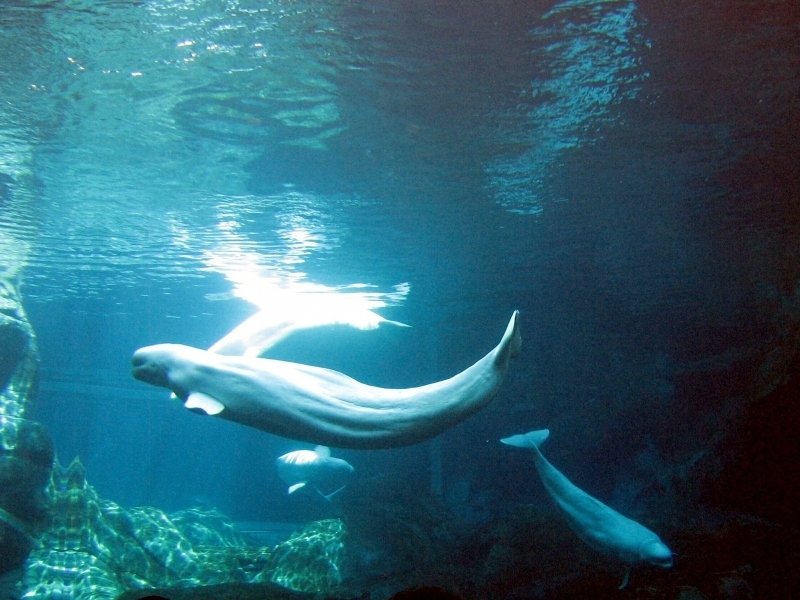 Their songs are also used in communication with other Belugas. 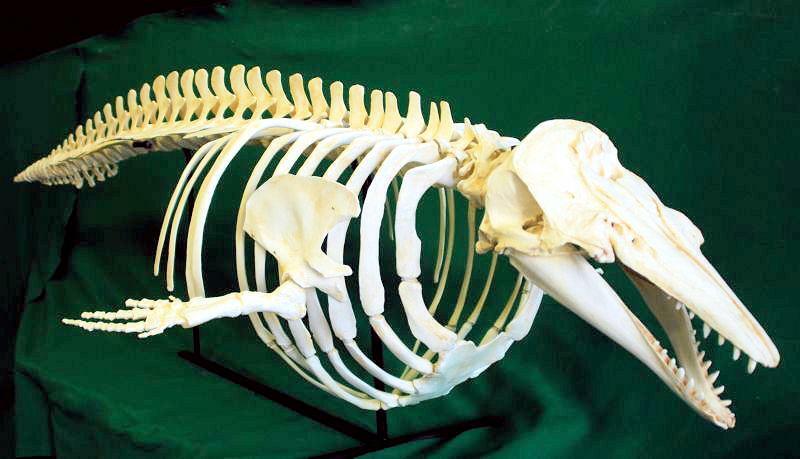 They produce many different sounds ranging from clicks, squeals and whistles. 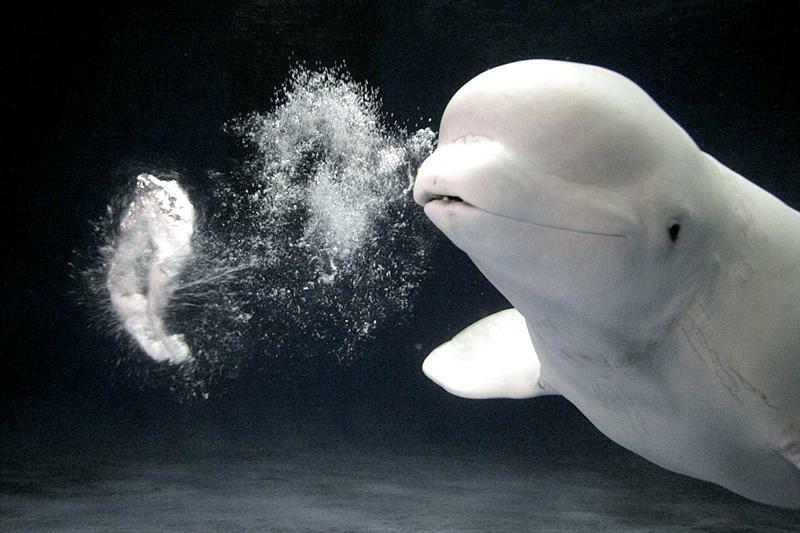 The fatty melon of the Beluga changes shape as the Beluga makes sounds. 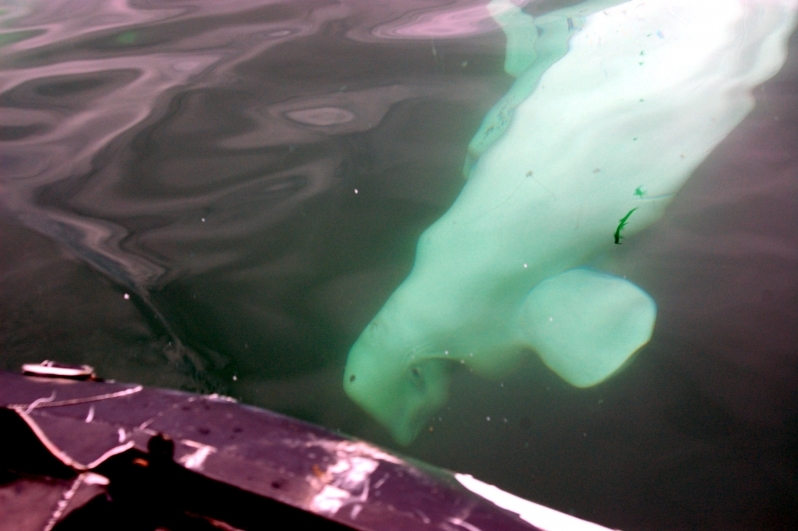 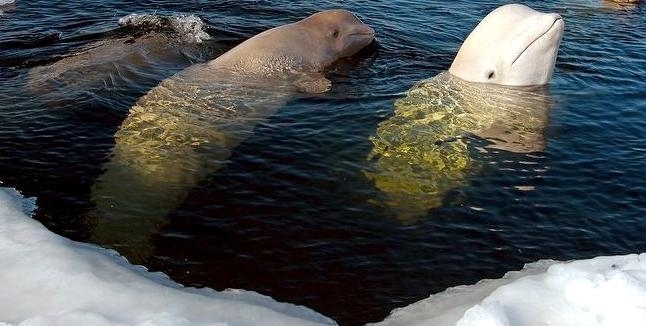 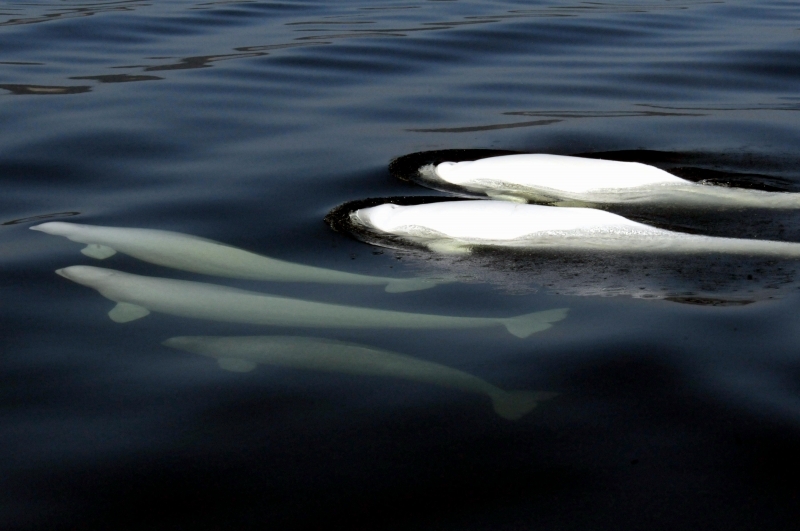 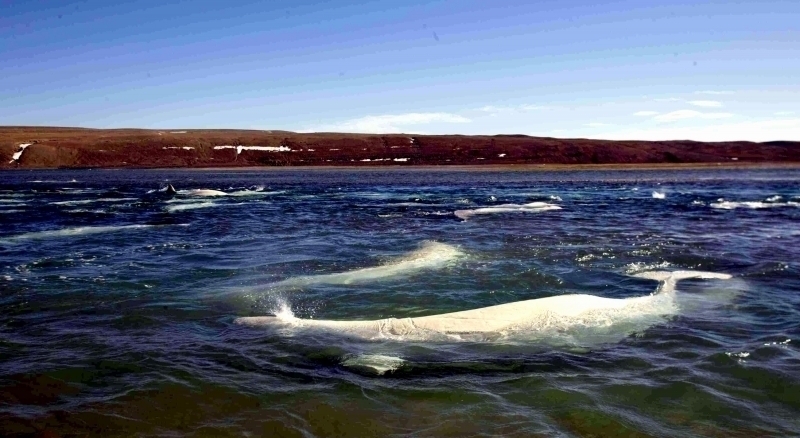 Belugas live in frigid arctic & sub-arctic waters, but some populations migrate south to warmer water in the summer. 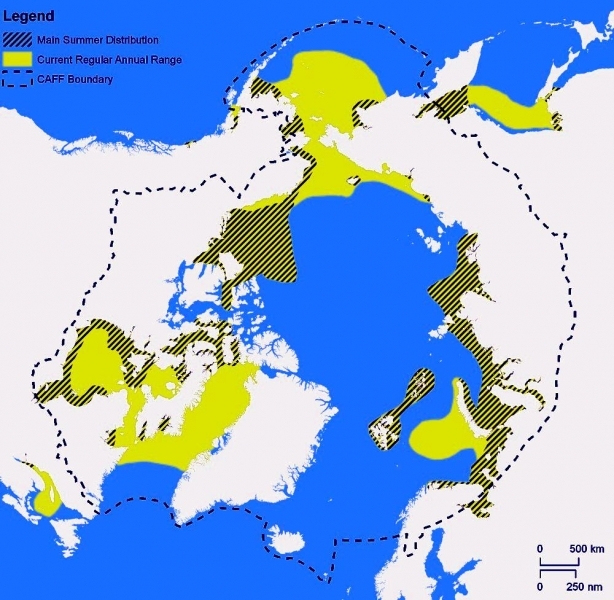 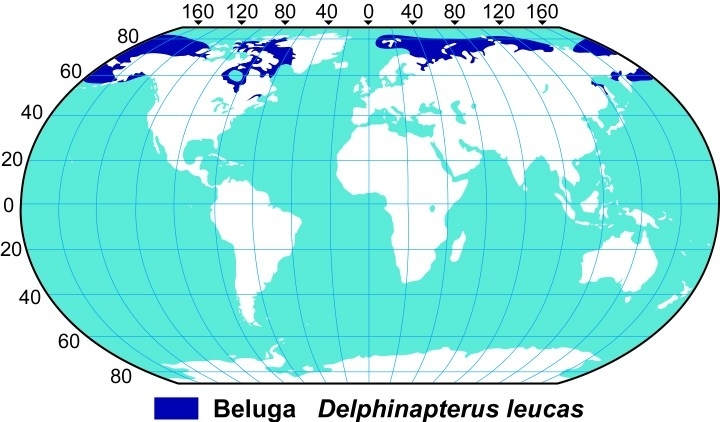 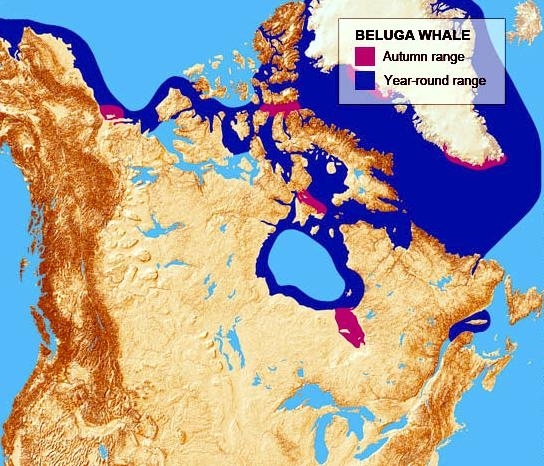 The Beluga’s Arctic habitat overlaps with Narwhal’s habitat. 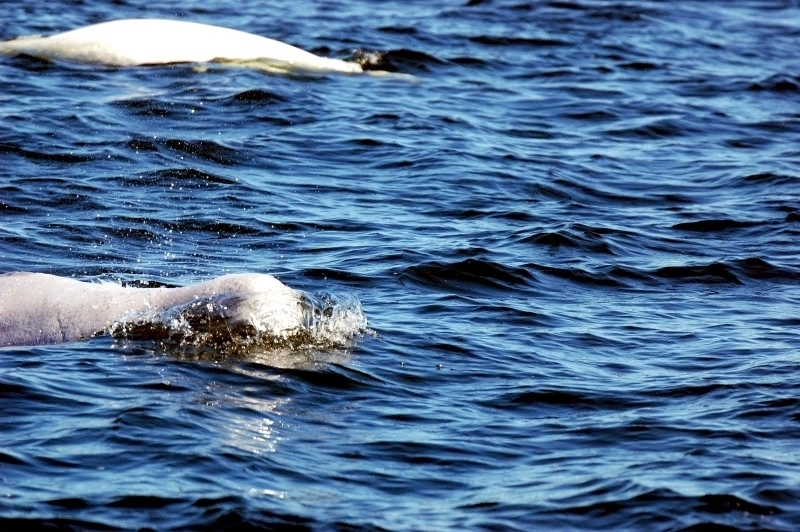 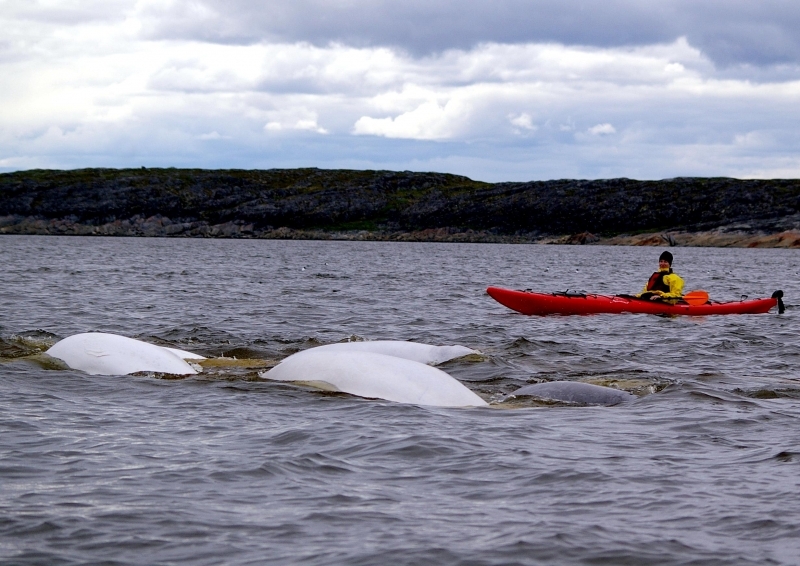 Belugas also travel up northern rivers into brackish (partly salty) water and estuaries where a river meets the sea to hunt prey during the summer. 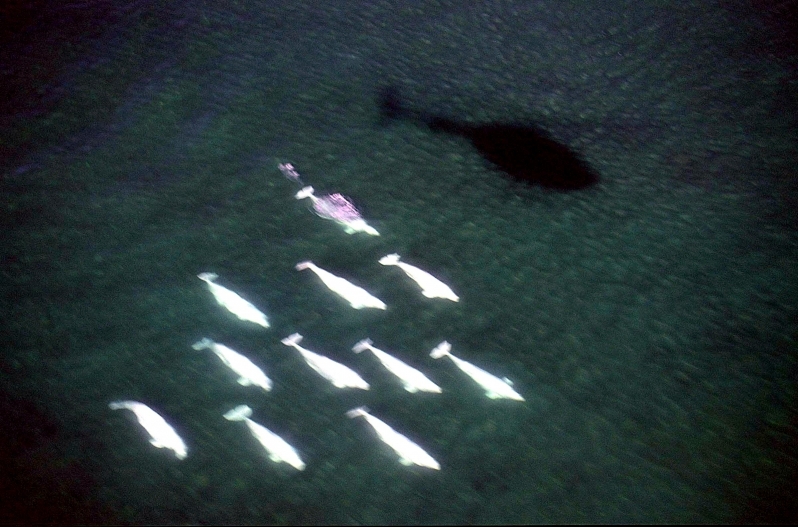 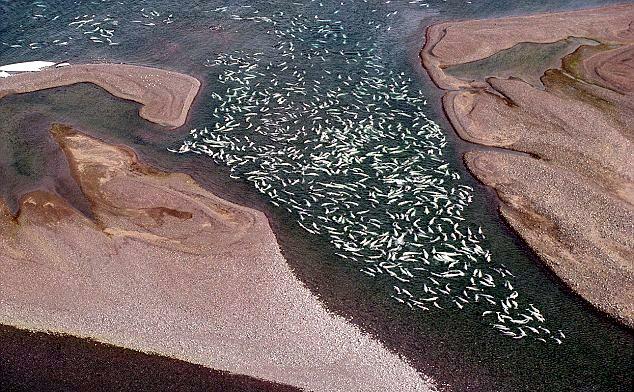 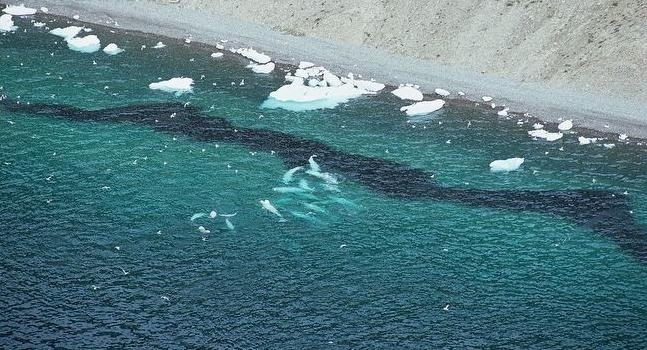 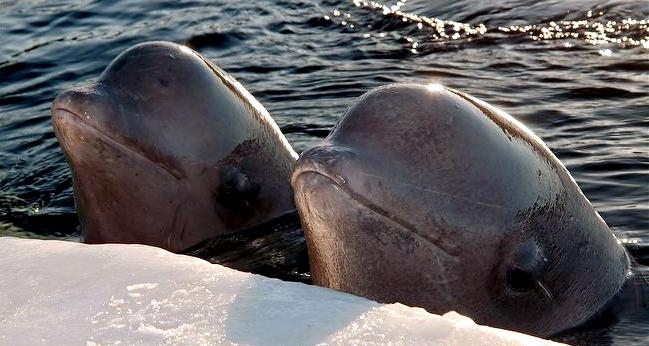 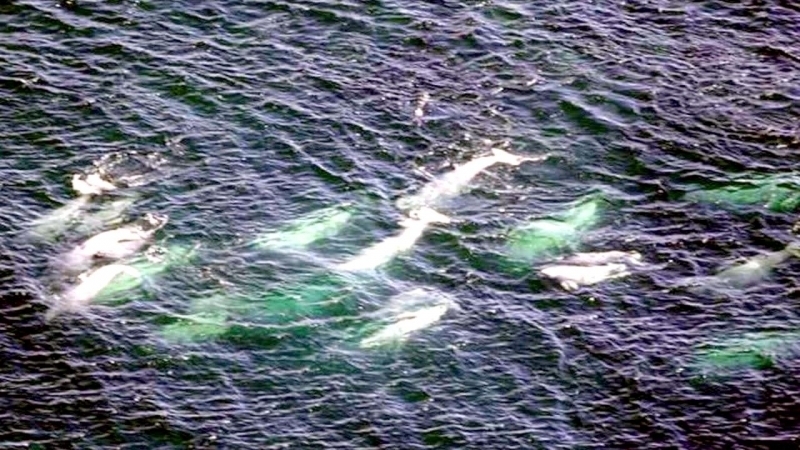 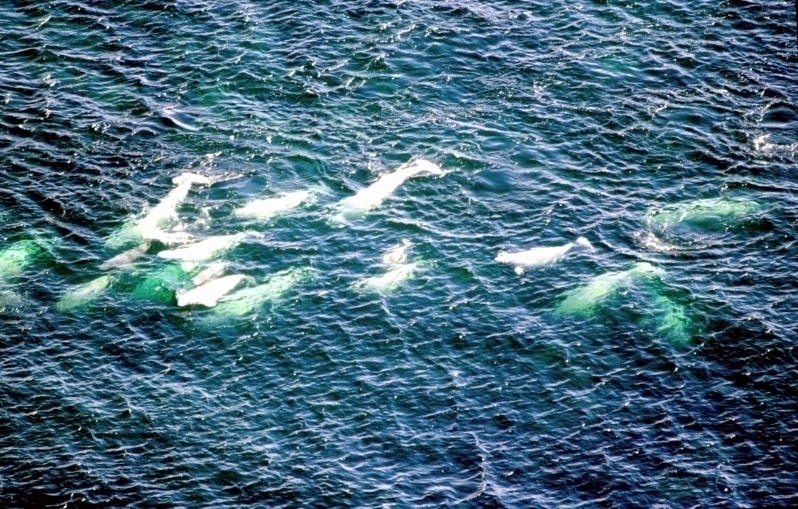 Belugas sometimes migrate with Bowhead Whales. 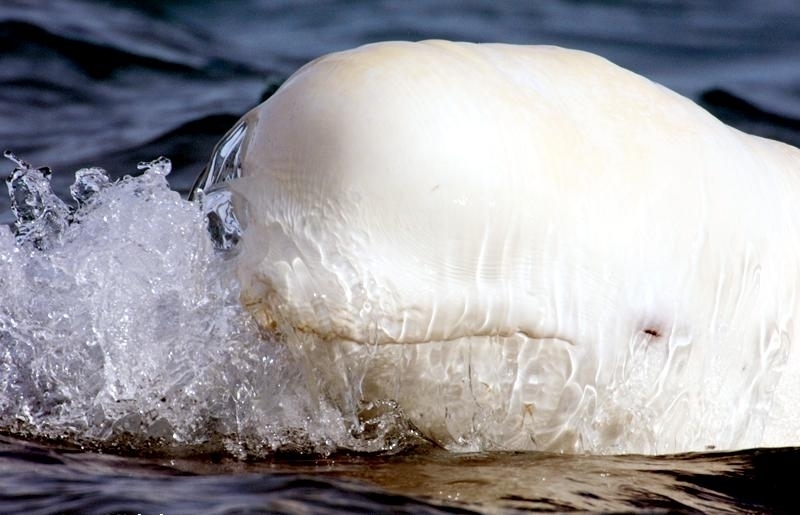 The gestation period of the Beluga Whale is about 14-15 months and the calf is born tail or head first and near the surface in warm, shallow waters. 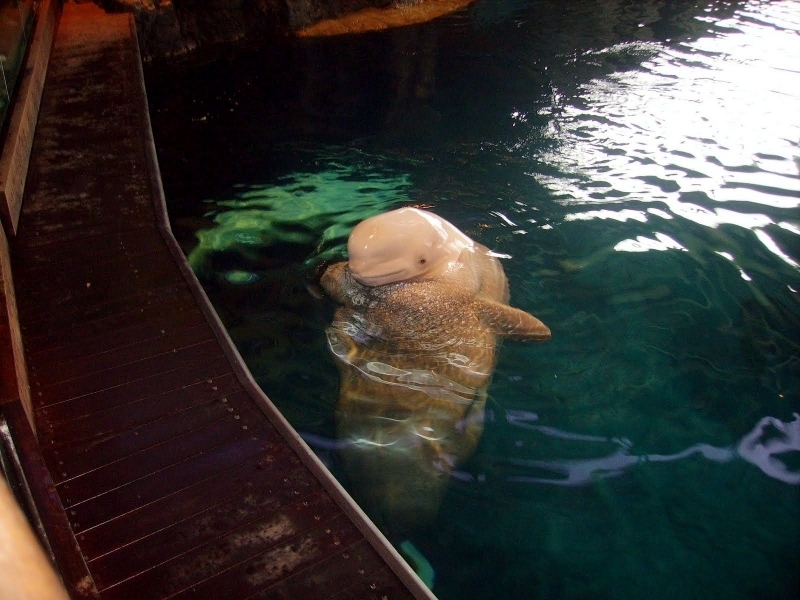 They breed in warm, shallow waters or estuaries (where rivers meet a sea or ocean). 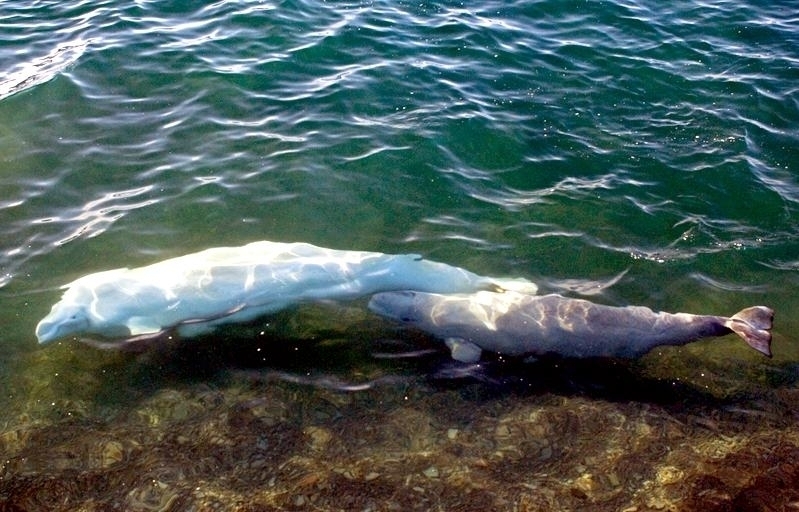 The newborn instinctively swims to the surface within 10 seconds for its first breath; it is helped by its mother, using her flippers. 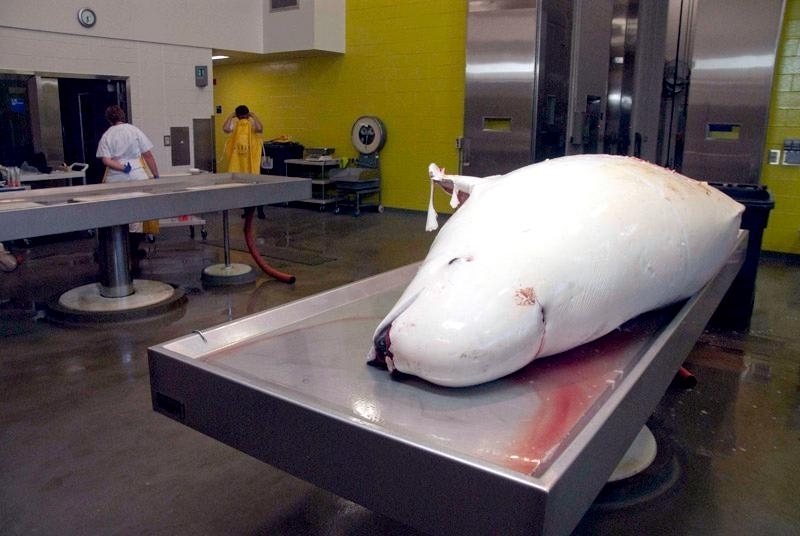 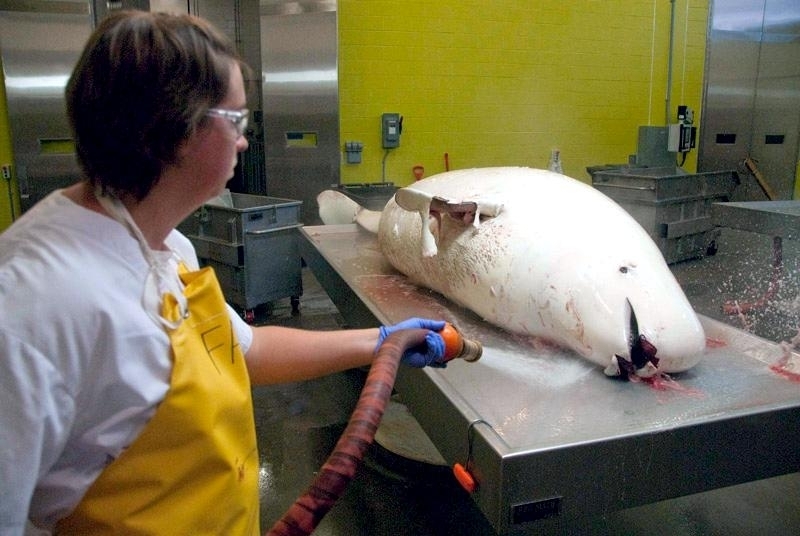 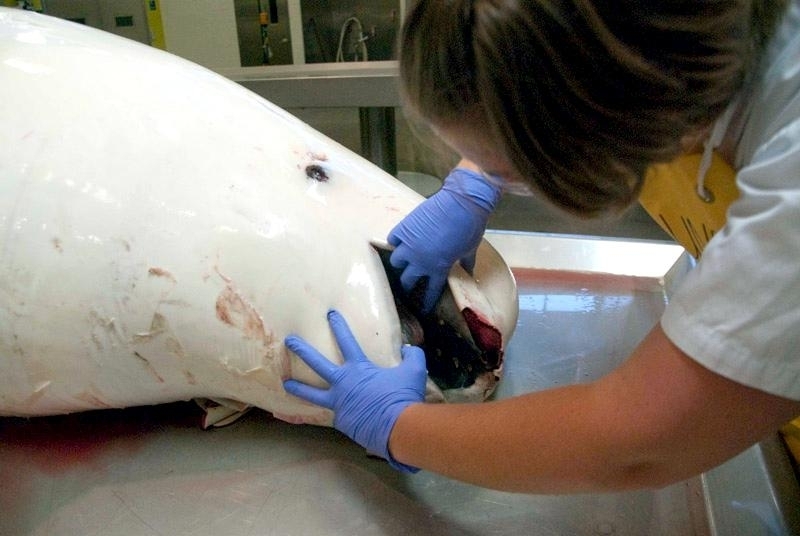 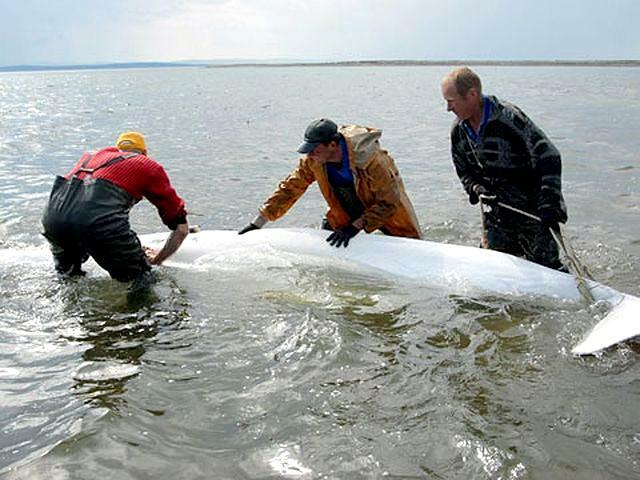 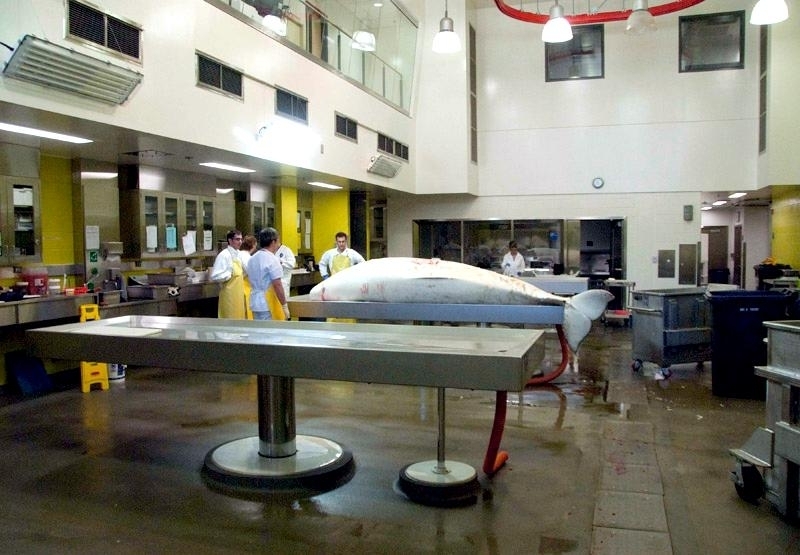 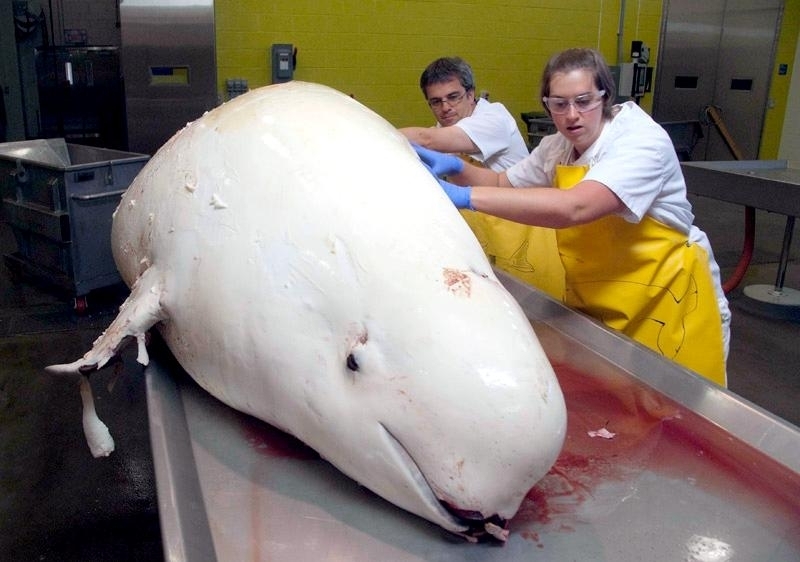 The newborn Beluga Whale calf is about 4-5 feet long and weighs over 100-140 pounds. 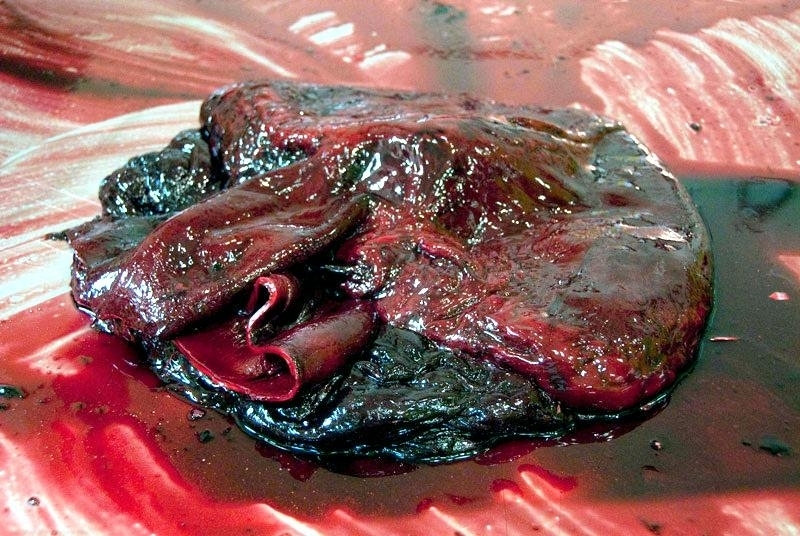 Single births are the norm; twins are very rare. 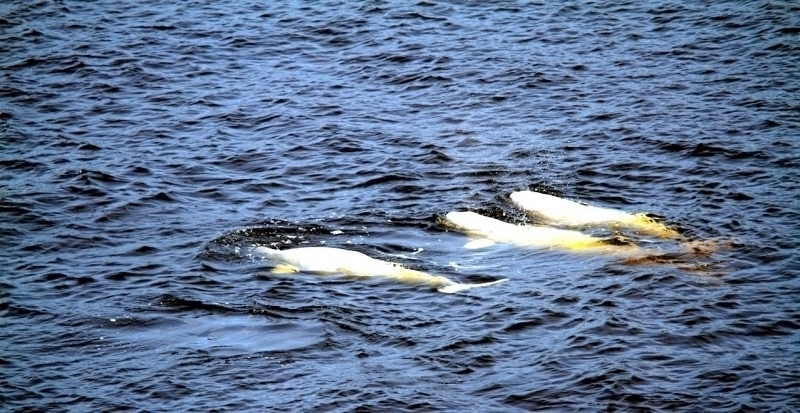 Calves are not white like the adults; they are blue to brownish-red for the first year of life. 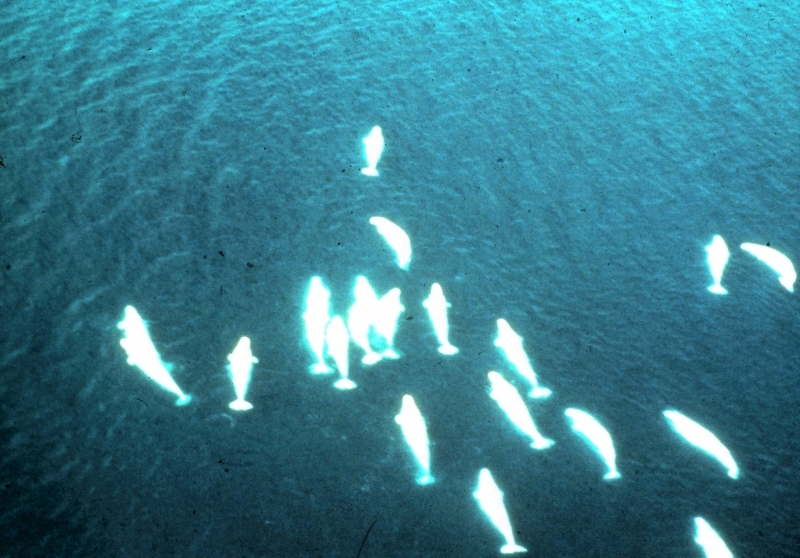 During the second year they are gray to blue. 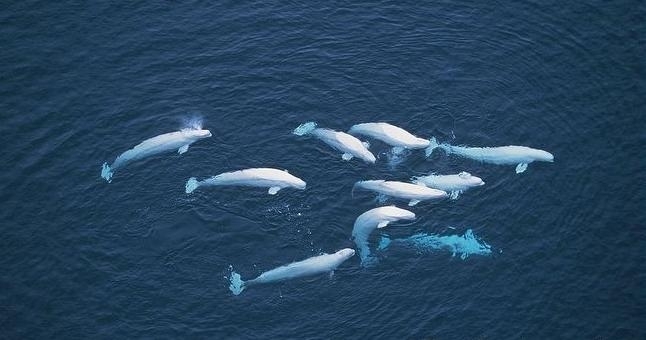 Their pigment or melanin fades slowly and by 6 years old, they are white. 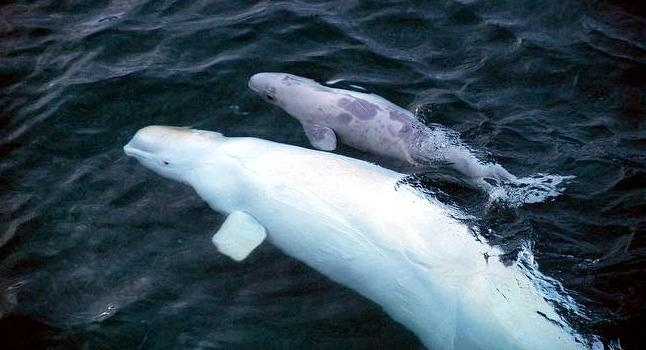 The baby is nurtured with its mother’s fat-laden milk (it is 28% fat) and is weaned in about 12-24 months. 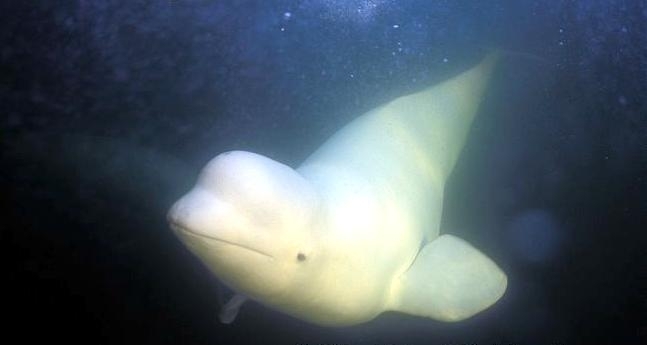 Beluga Whales reach maturity at 7-9 years. 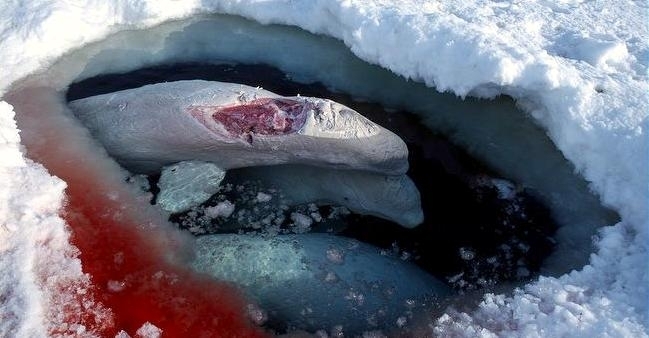 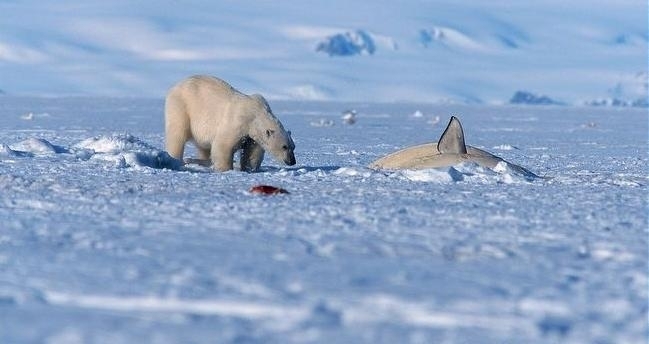 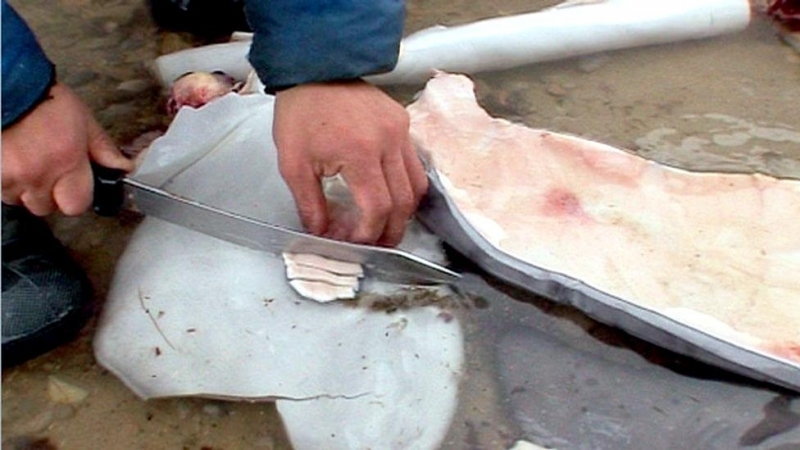 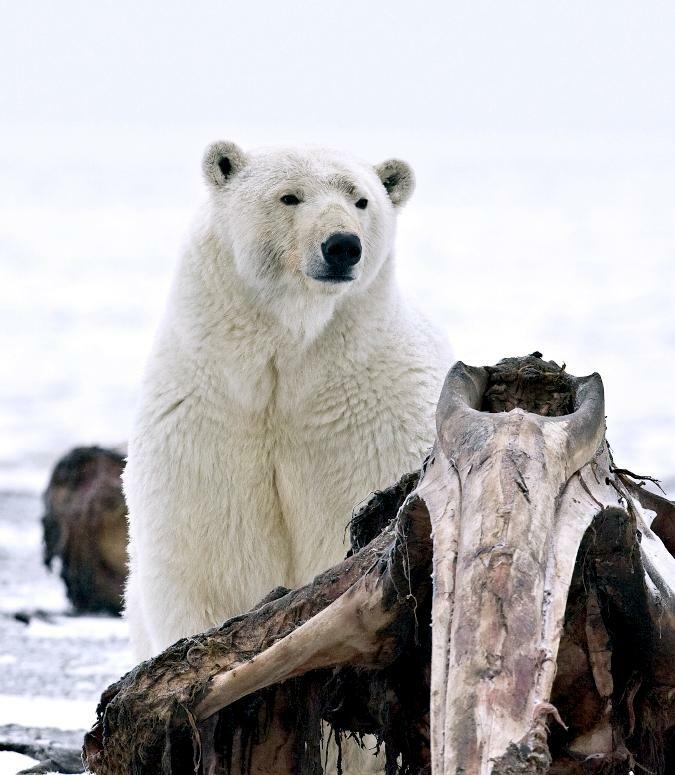 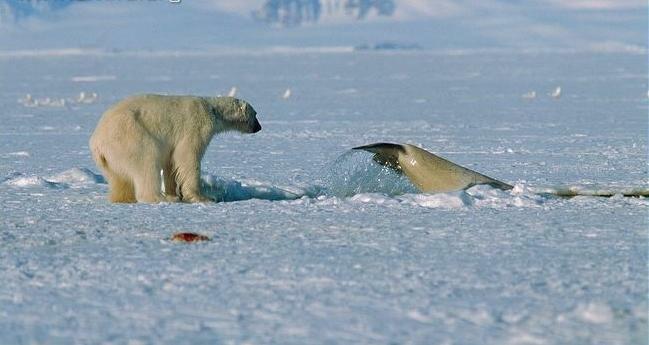 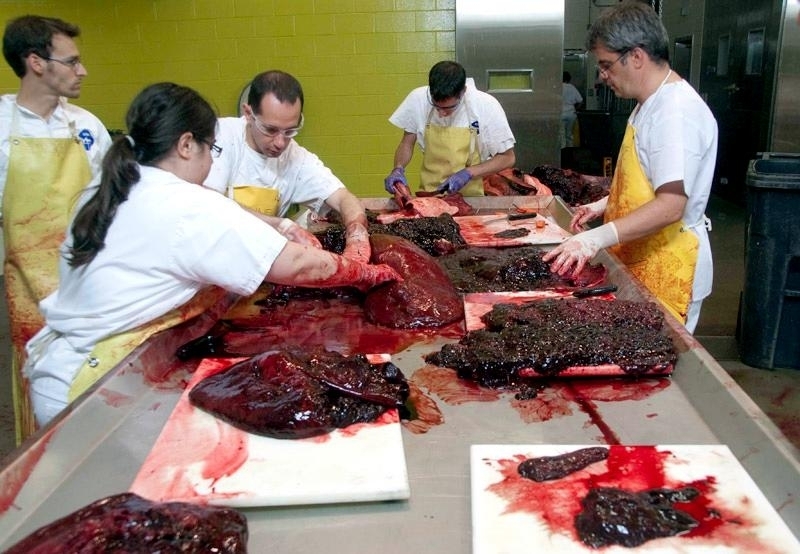 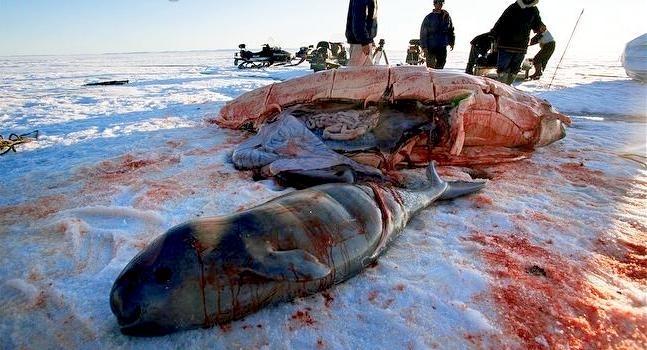 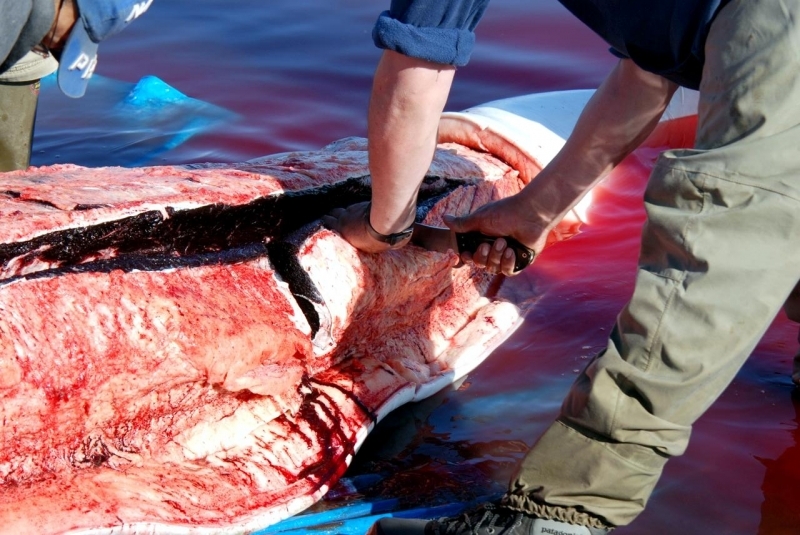 Killer Whales & Polar Bears prey on Belugas, especially the calves. 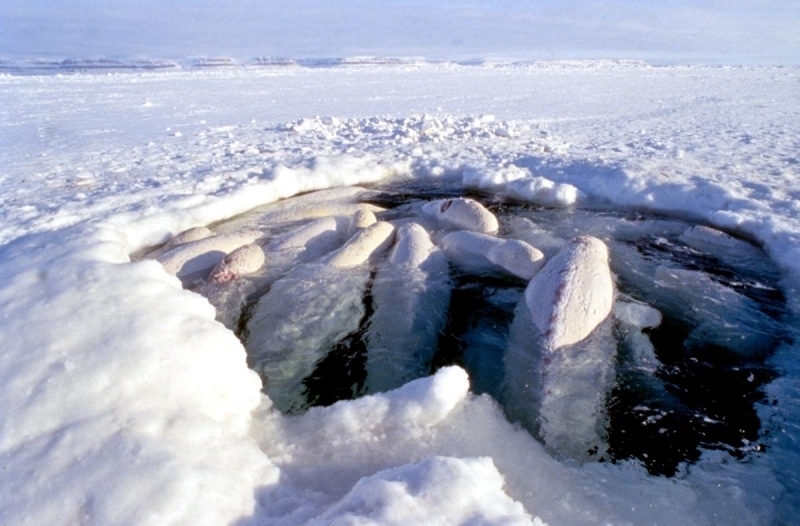 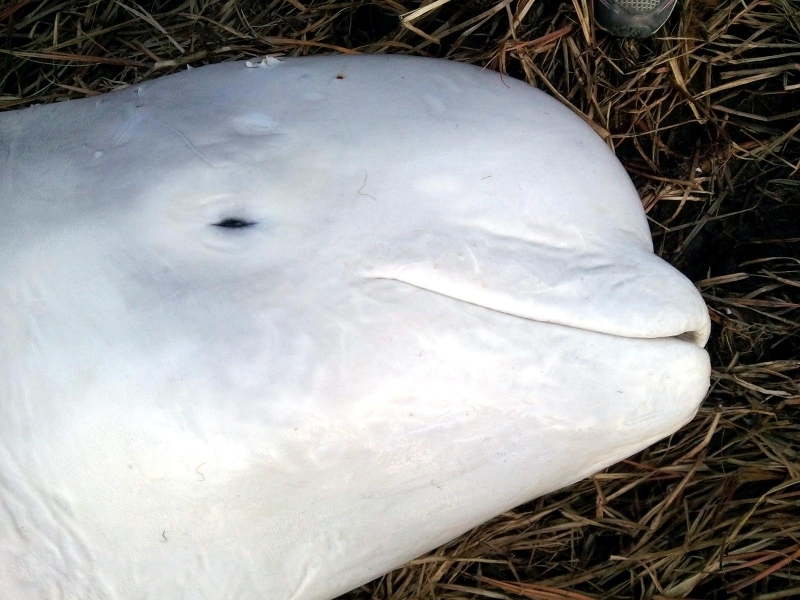 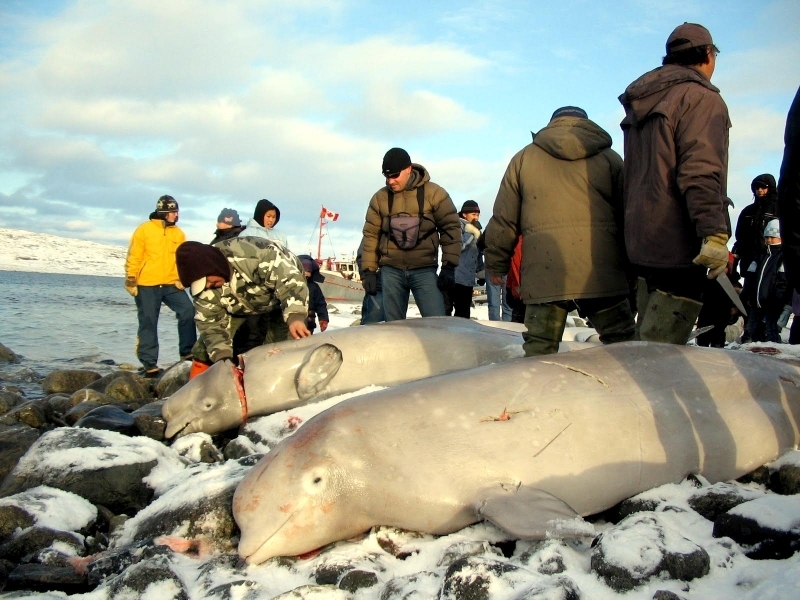 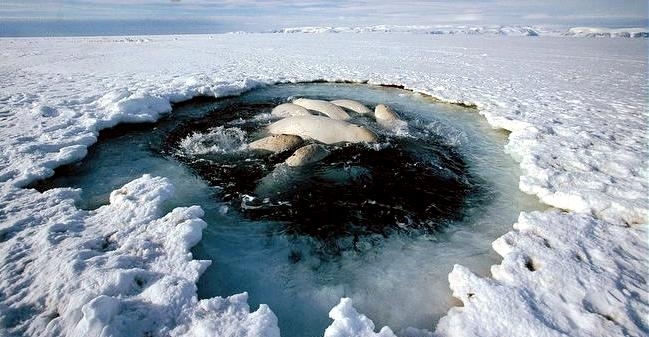 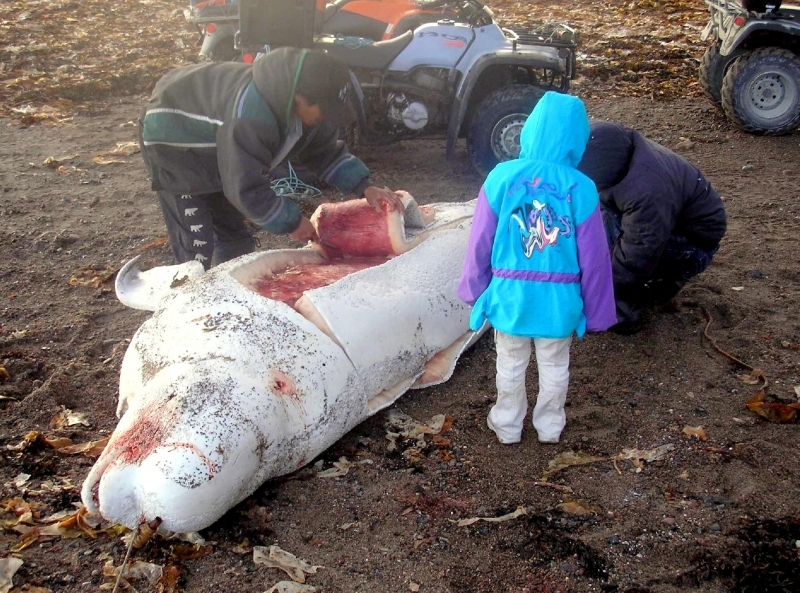 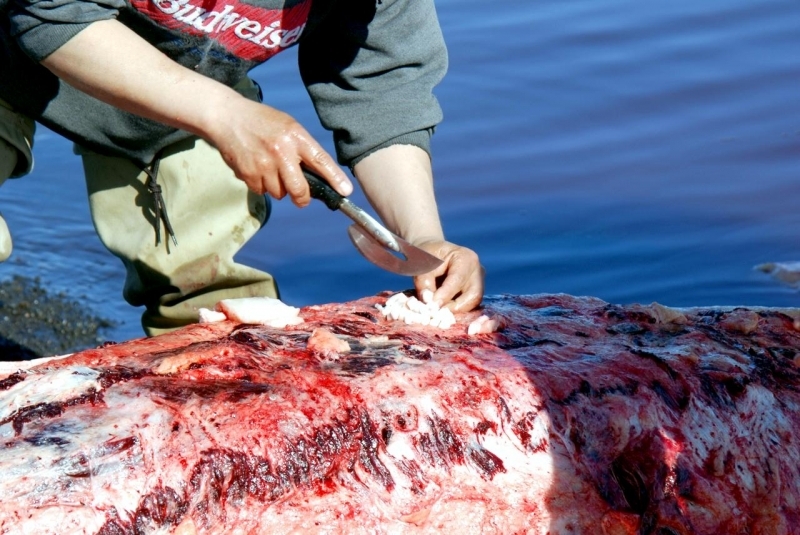 Native people have hunted Belugas for hundreds of years, but Belugas are now only hunted by a few Arctic-dwelling tribes. 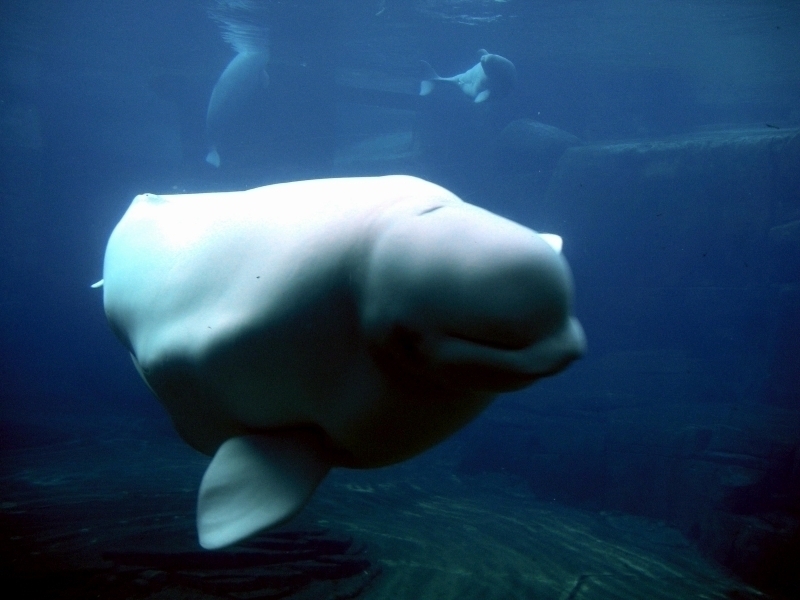 Beluga Whales have a life expectancy of 25-30 years. 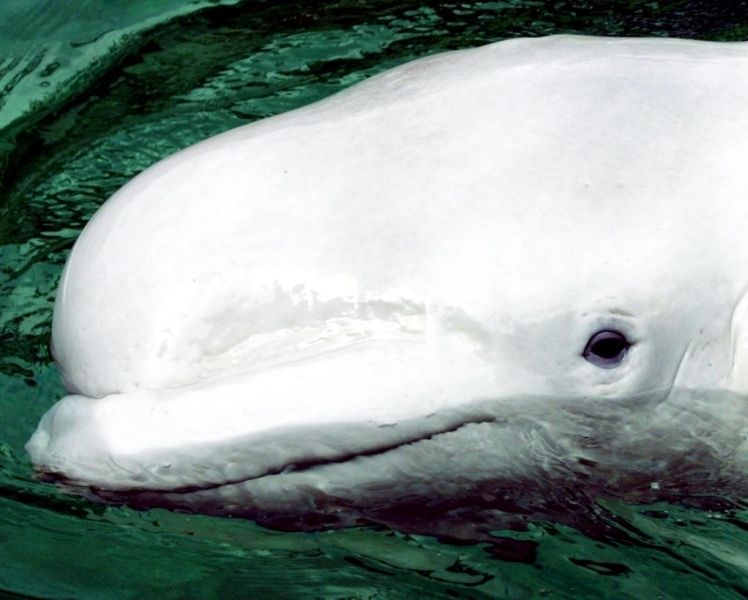 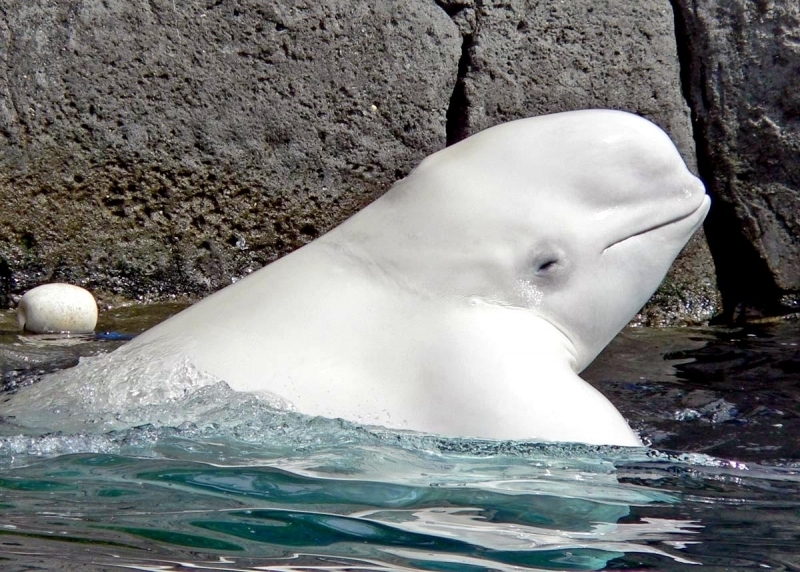 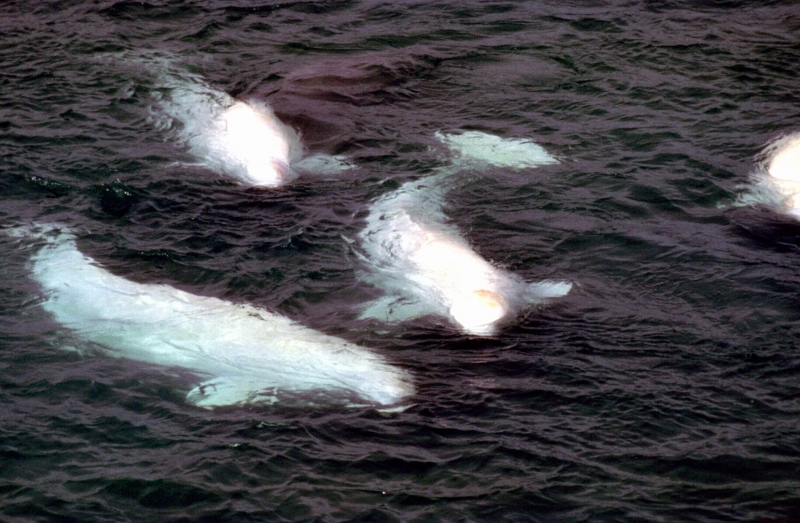 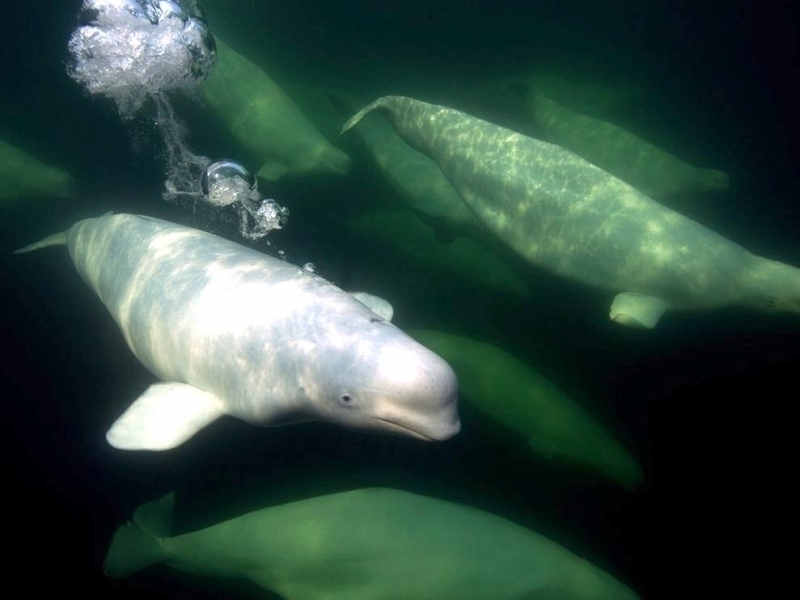 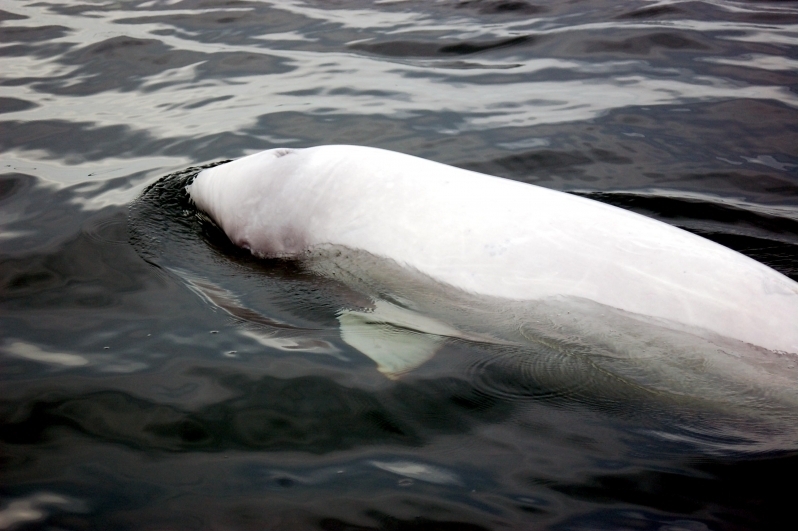 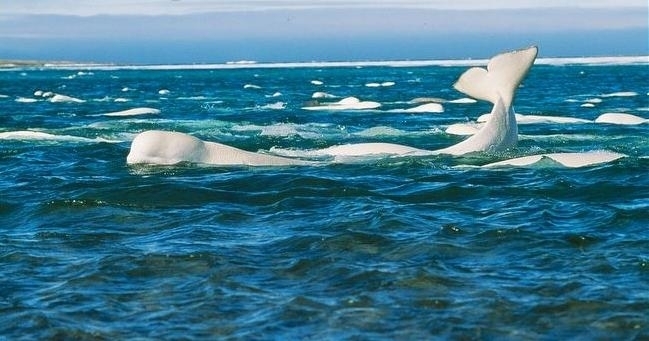 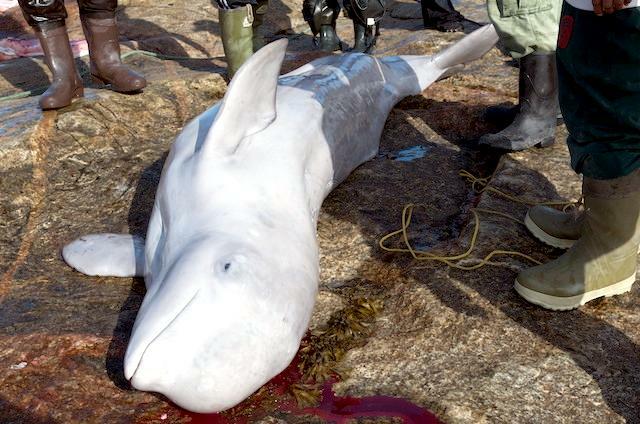 It is estimated that there are about 40,000 to 80,000 Beluga Whales worldwide with the St. Lawrence, Cook Inlet and Alaskan Belugas currently classified as endangered. 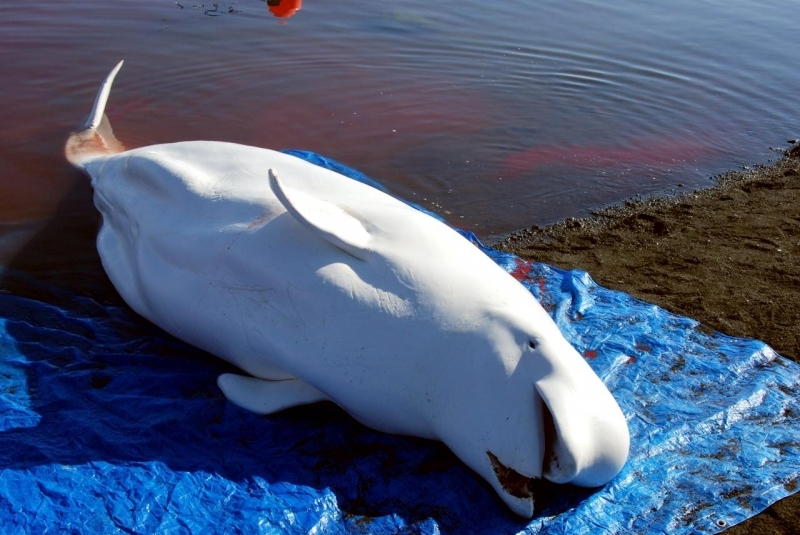 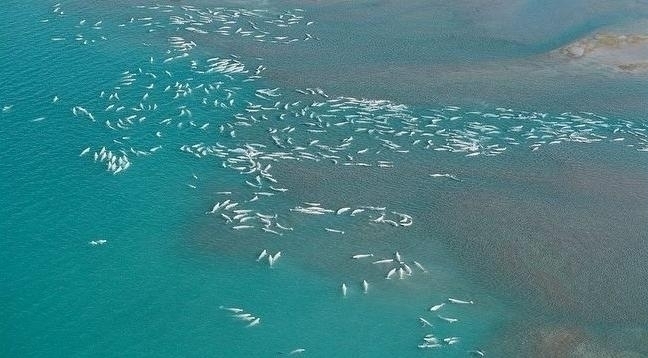 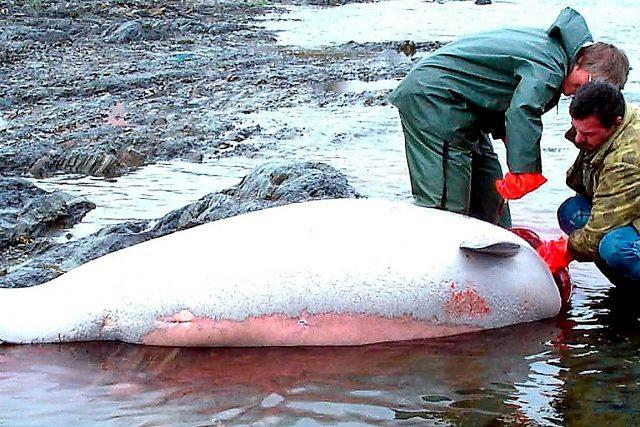 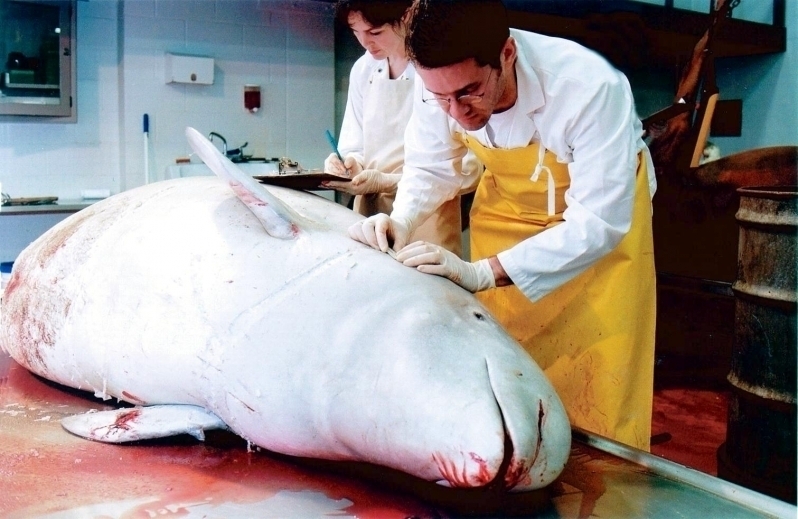 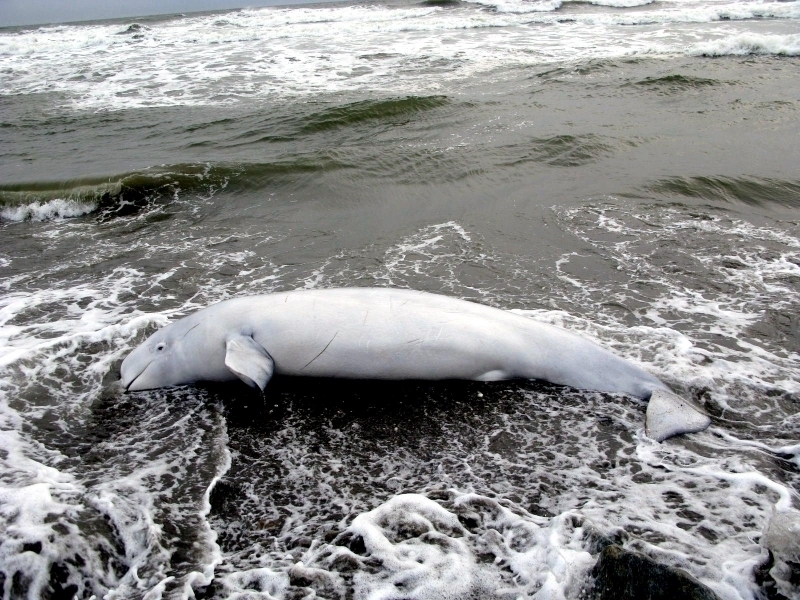 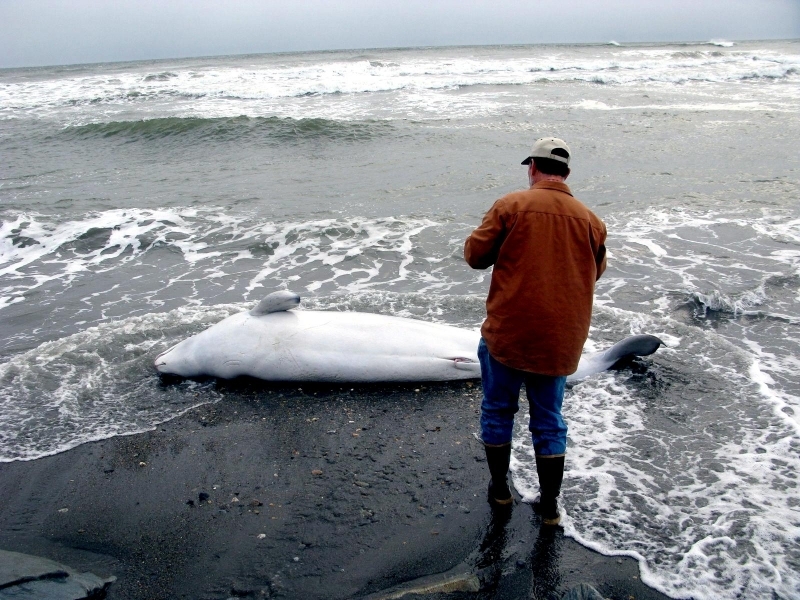 Belugas are threatened by pollution (DDT, PCB’s, etc.) 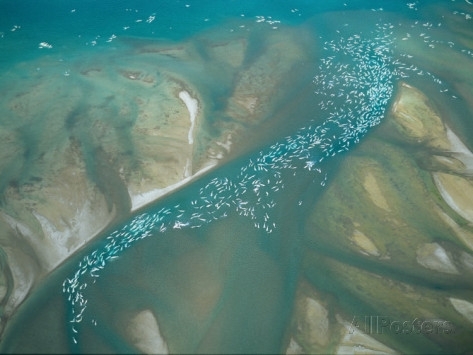 in estuary waters that they frequent & breed in.